The Renault Duster has been launched in India at a price of between Rs. 7.19 - 11.29 Lakhs (ex-Delhi). In an uncanny twist of fate, Renault takes on Mahindra - once partner & now competitor - with an SUV based on the same Logan platform that formed their marriage in '07. 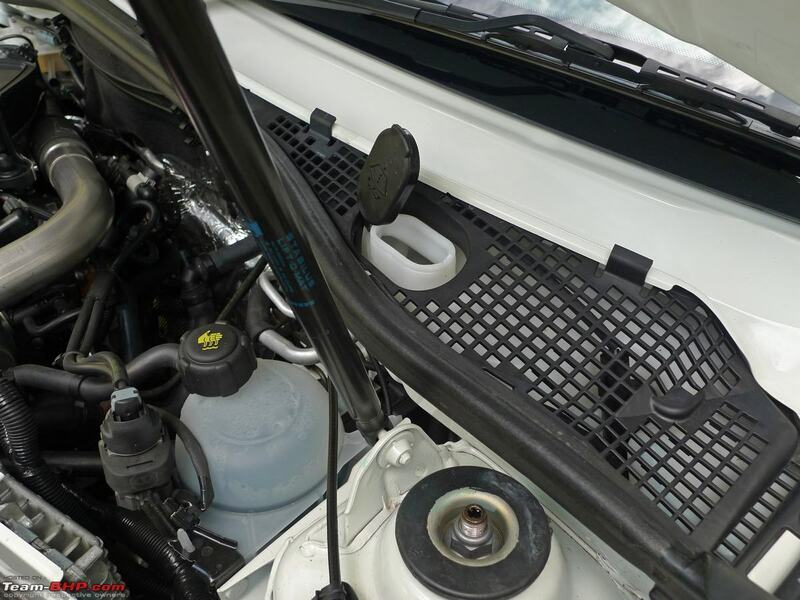 The Duster is positioned at the heart of the Rs. 7 - 12 lakh UV segment...a segment that makes up most of Mahindra's bottom line. 2012 has seen sales of SUVs & MUVs (combined) overtake sedans for the first time ever. Our market's fascination with SUVs is well acknowledged; however, not everyone wants to drive a gargantuan SUV in crowded Indian cities. The time of compact SUVs has indeed come. 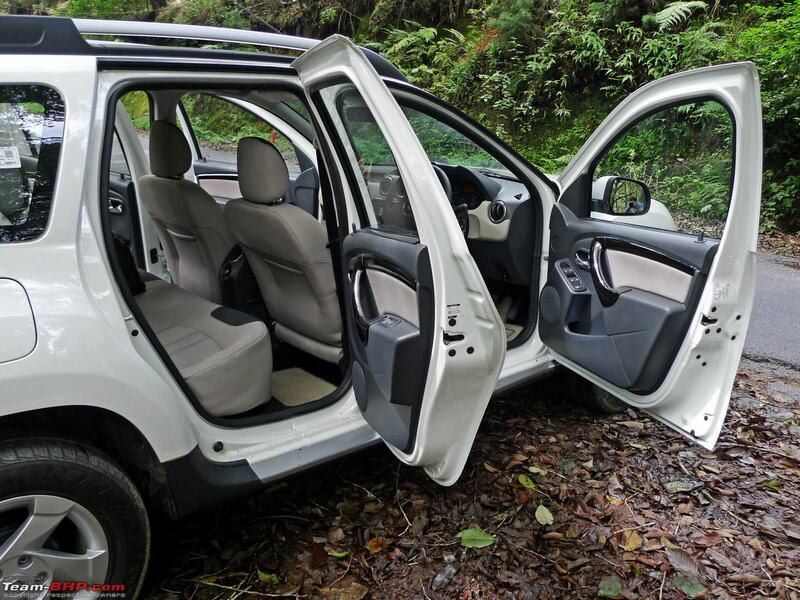 With a monocoque construction (unlike the other ladder-on-frame utility vehicles), compact SUVs are lighter and, being sedan based, very car-like to drive as well. However, they aren't as tough as traditional ladder frame UVs, especially in load carrying or offroad applications. 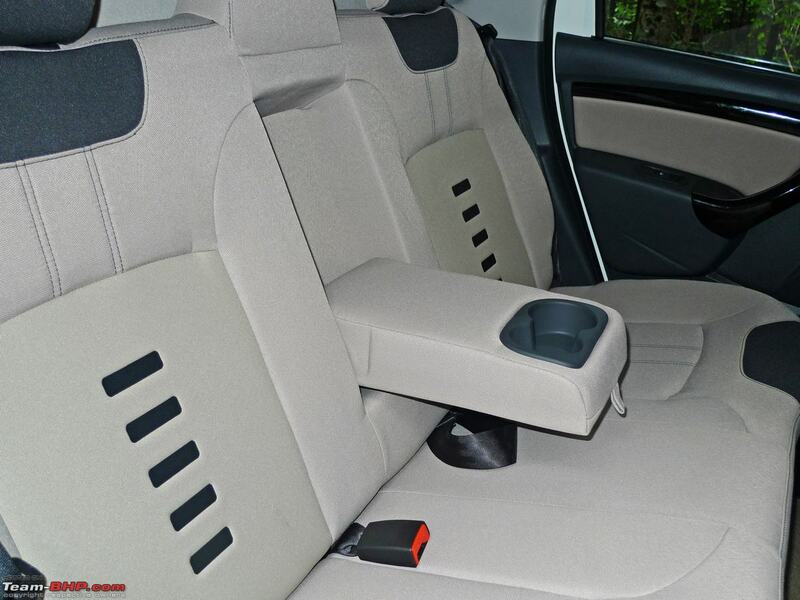 The monocoque UV seldom has a 3rd row of seats either (Ertiga being an exception). While commercial users will undoubtedly stick to conventional UVs, it's the personal user that the compact SUV has square in its sight. Cross-shopping across segments is commonplace in India, and the target customers include those who are considering a premium hatchback or C segment sedan. The compact SUV category is poised to heat up with many manufacturers currently finalising their plans for launch. The Ford EcoSport is being prepared for a 2013 entry, while the Maruti XA Alpha, Chevrolet Trax and Ssangyong Korando might follow soon after. 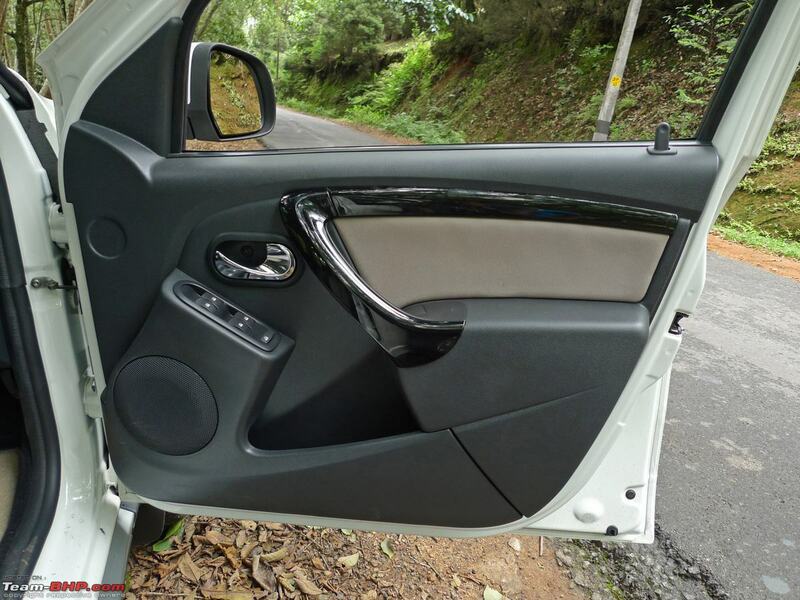 The sub-4 meter Mahindra Xylo will also target the same personal owner who is looking for more than a hatchback or sedan. Renault is doing all it can to cash in on the first-mover advantage. The initial Dacia product for India (i.e. 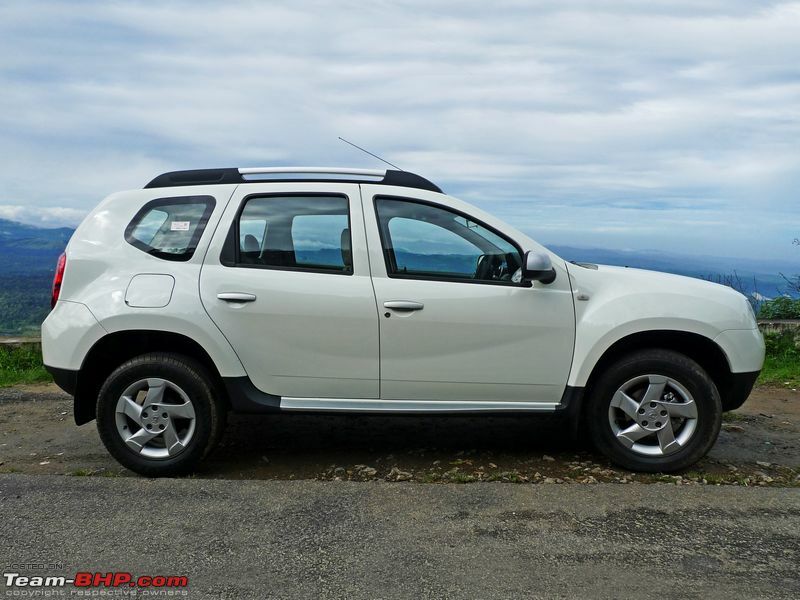 Logan) may have failed, but if the booking volumes are anything to go by, the second Dacia (Duster) is off to a strong start. Sources indicate that booking volumes have crossed 12,000 already, with customer deliveries starting toward the end of July. The Duster is the 4th Renault that has been launched in India. The Fluence, Koleos and Pulse met with a poor market response. This SUV might just be the game changer for Renault, with the potential to multiply the company's marketshare by 5 - 6 times overnight. Renault’s sales target for the Duster is 3,000 – 4,000 units a month. This is actually the first time that Renault as a brand has gotten so much attention from the Indian masses. Fact is, a good part of them weren't even aware of Renault's Indian presence. As we found out, the interest in the Duster is extremely high. Over our 3 day review event, innumerable folk (including those from rural India) interrupted our drive / photo shoot with questions on the new "Renolt". 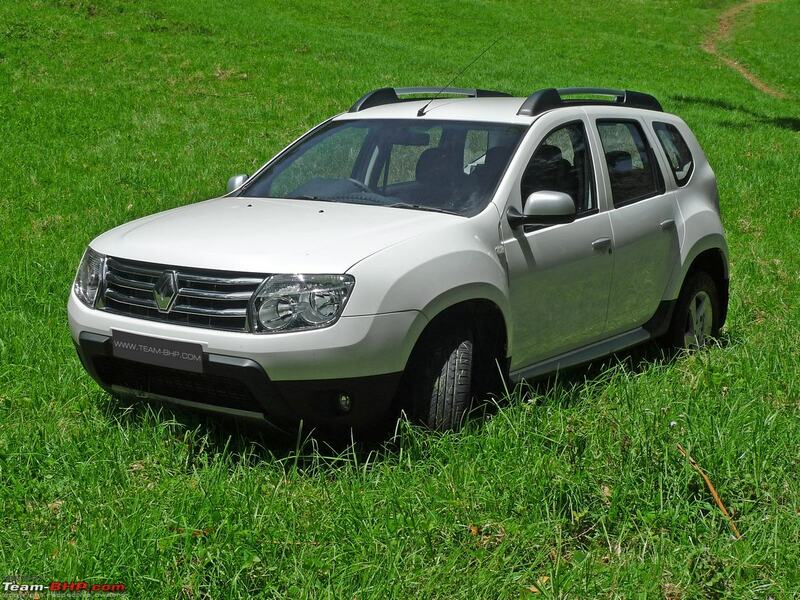 The Duster is primarily sold as a Dacia product internationally. Most of its markets are developing countries, albeit a UK launch is around the corner. 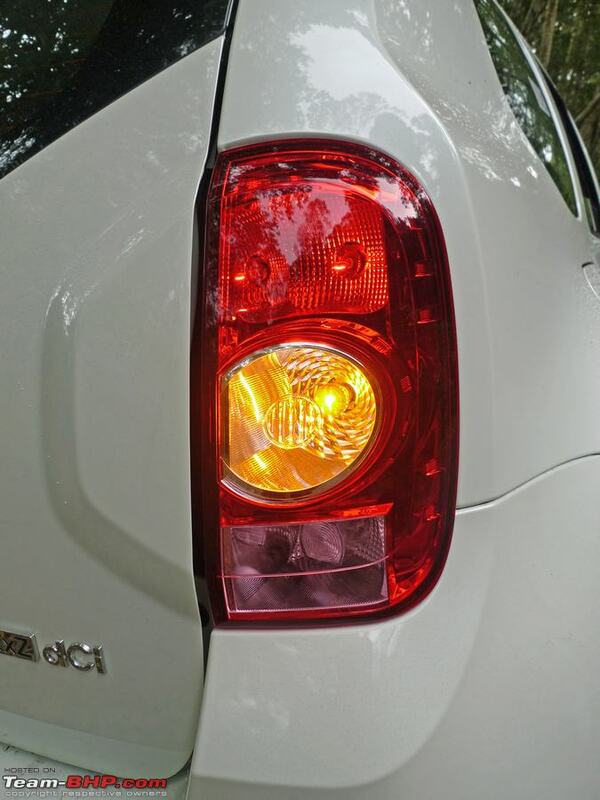 The Dacia brand is synonymous with low cost cars that have simple, robust underpinnings. The Duster's clothes will please all and excite none. It's nowhere as in-your-face as the XUV500 or the EcoSport. 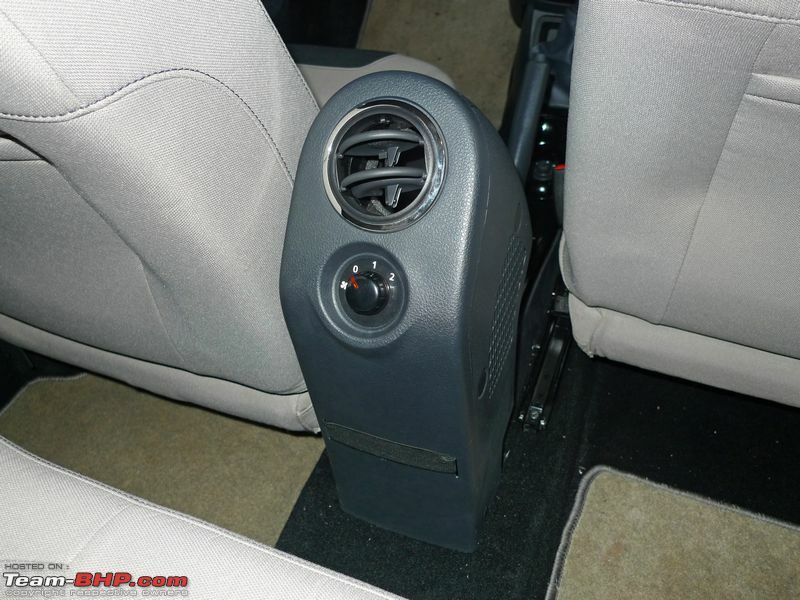 I might add that, as a man of traditional taste, I prefer the Duster's simple design to that of the awkward Skoda Yeti. The front is the best looking part of this car. Its face has an imposing stance, thanks to the bulky wheel arches, large headlamps & brash chrome grille. The silver skid plate adds to the rough & tough look, although you should be warned that it's made of plastic and is thus, easy to break. The intimidation ends at the front, and the small dimensions don't give this SUV the street cred of the Scorpio or better still, the Safari. The Duster isn't very tall; that's probably why the roof rails (which enhance its height) are standard, even on the base variant. The plain-jane doors make for a rather bland side profile. Also, the flap-type door handles went out of style in the nineties, while their silver paint is a cheap touch. 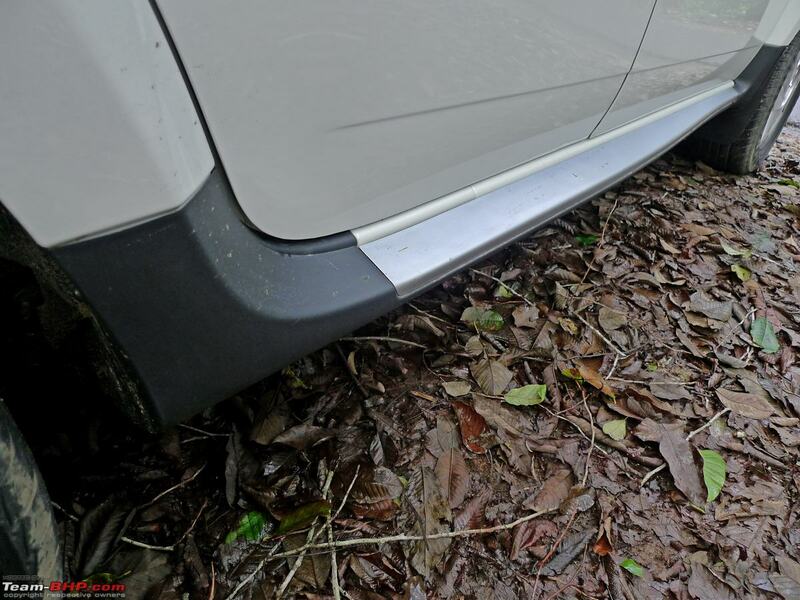 The beefed up wheel arches lend the Duster a wide & planted look, especially when viewed from the rear. 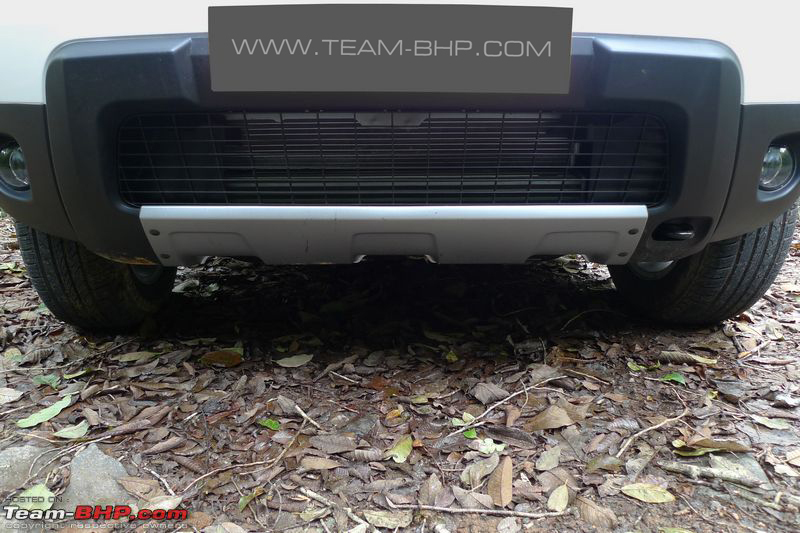 One way that Renault could have greatly improved the Duster's looks is by mounting the spare wheel on the tail gate. The wheels & tyres are simply massive. 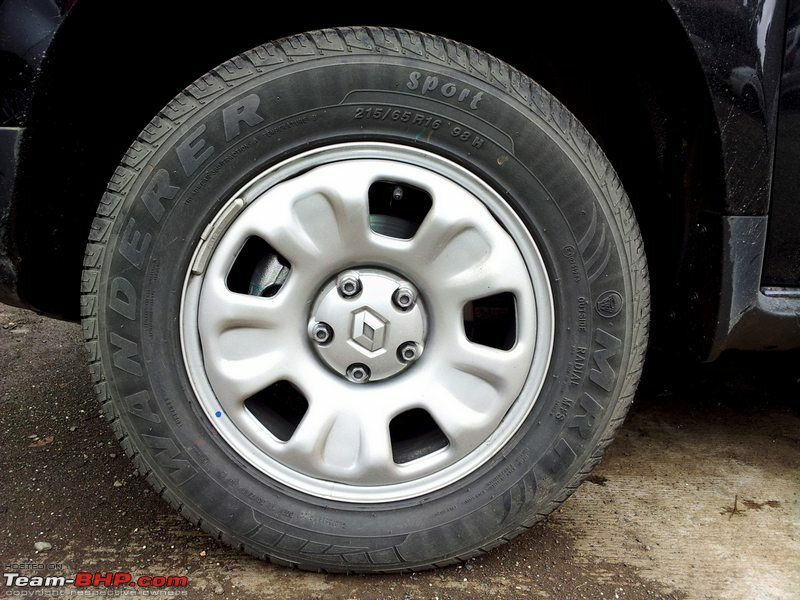 I'm glad that Renault chose 215/65 R16 tyres. 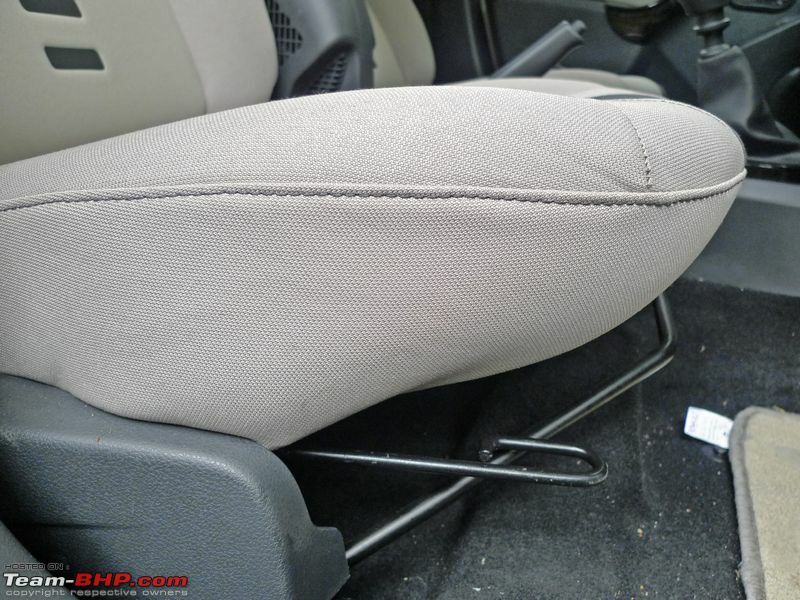 Not only does this size offer superior grip, but it also improves the Duster's stance. 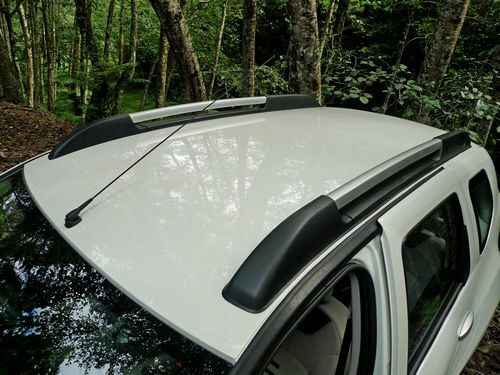 Many BHPians commented that the Duster looks like an overgrown hatchback. Well, after seeing the vehicle in person, I have to disagree with them. 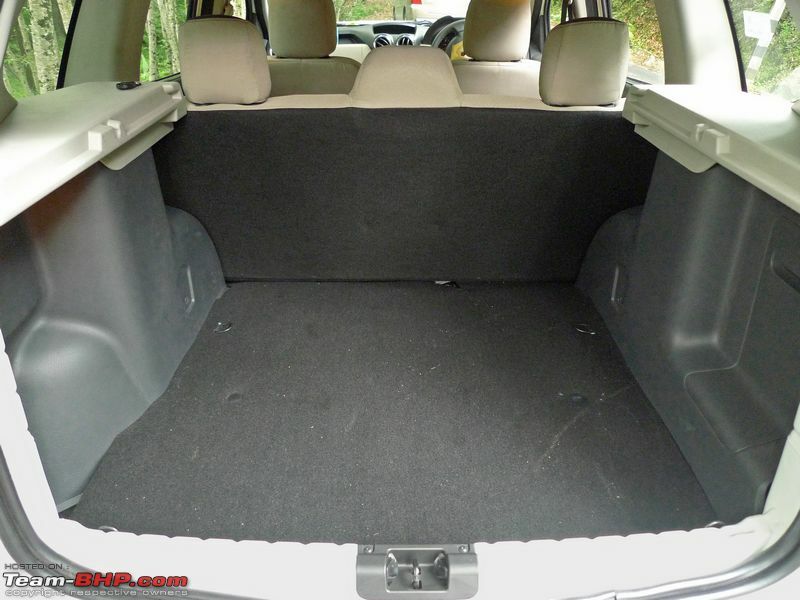 Sure, the Duster isn't a big, butch SUV, but it’s still an SUV...compact dimensions aside. 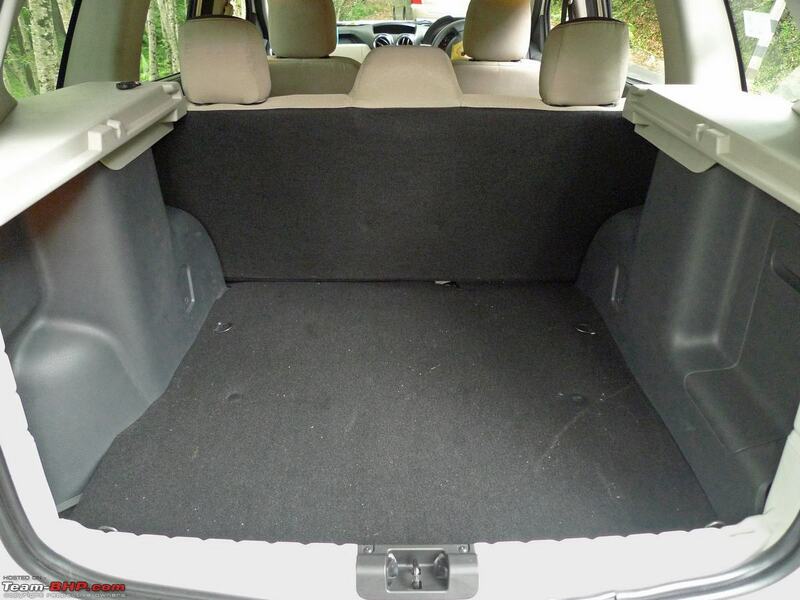 In terms of footprint, I'd place the Duster in the ballpark of the Skoda Yeti. The small footprint could work as an advantage or a disadvantage, depending which side of the fence you are on. As mentioned earlier, a large SUV can get unwieldy in dense traffic and is tougher to park in the city. The current level of localisation is 60% and Renault plans to increase the same to 80% in the near future. Exterior build & quality are satisfactory for the most part. 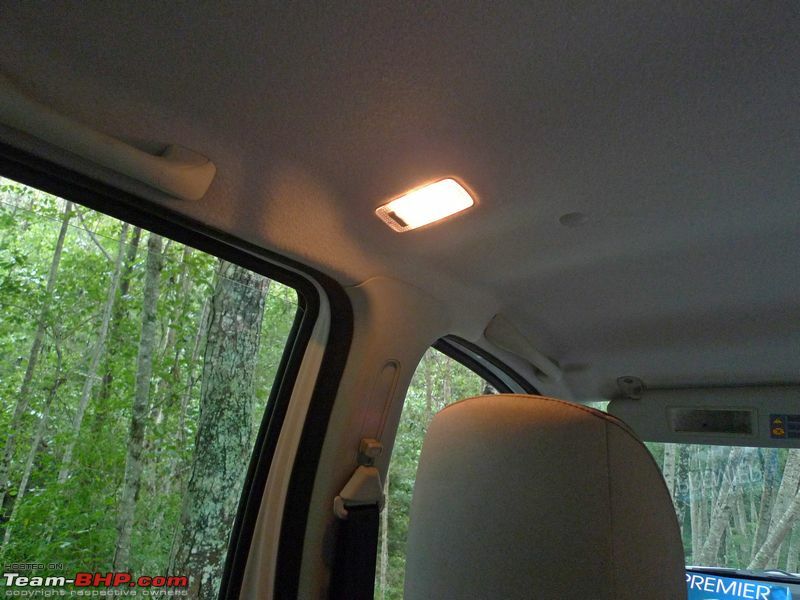 Unlike the interiors, there aren't too many visible signs of cost cutting (except for the cheap wipers and flap-type door handles). 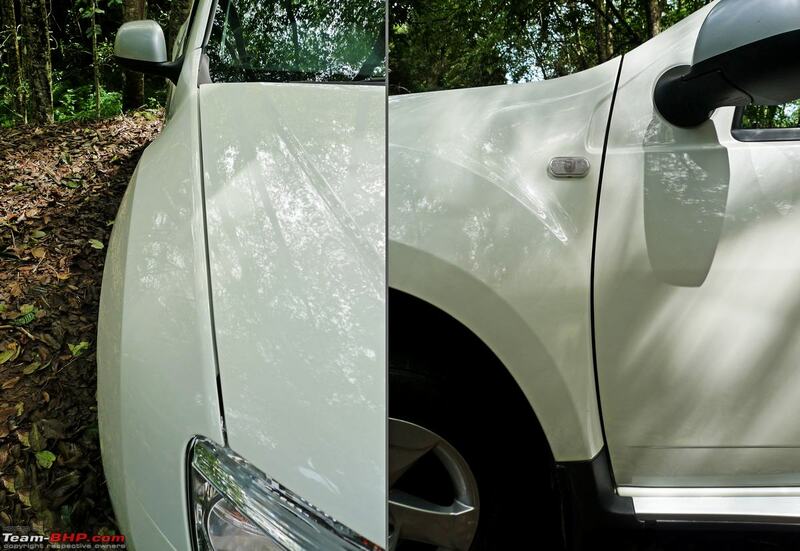 The paint quality is good, and the Duster is the first car we've seen from the Renault-Nissan Chennai factory that has consistent panel gaps (the Micra, Pulse & Sunny don't). The bonnet & tail-gate feel sufficiently solid. On the other hand, the doors feel really hollow and have none of that satisfying thud. 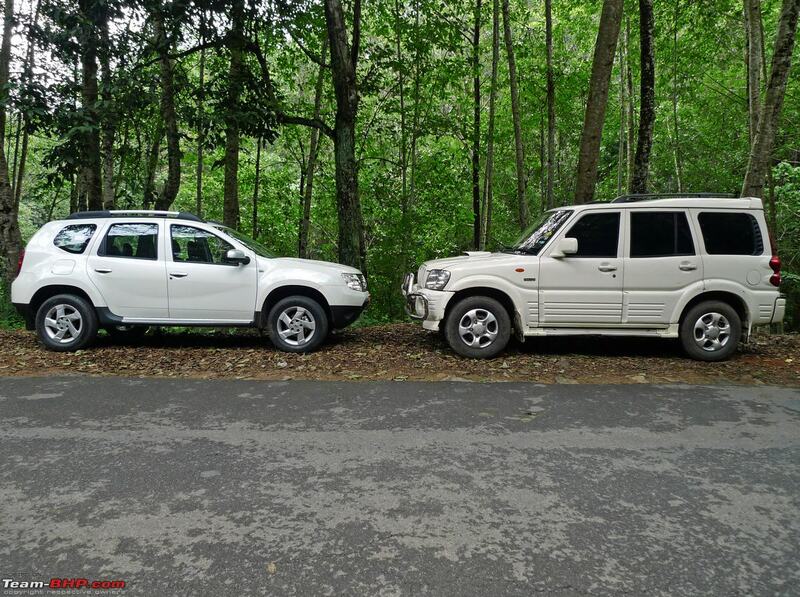 Still, overall quality is generations ahead of what the Mahindra & Tata UVs have to offer. Where the Scorpio & Safari are shoddily built and crude, the Duster comes across as a more refined vehicle. This is an advantage that the urban owner will be particularly drawn to. 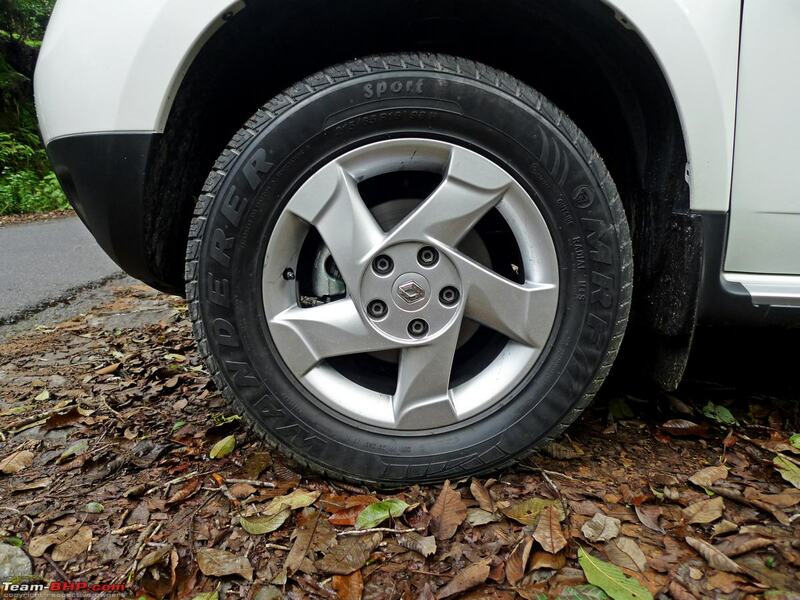 The Duster shares its platform with the Logan and has proven underpinnings. Hence, I'm reasonably certain that it will perform as a workhorse. After all, there are thousands of satisfied Logan taxi owners who have driven 200,000 kms (& counting) on their steeds. 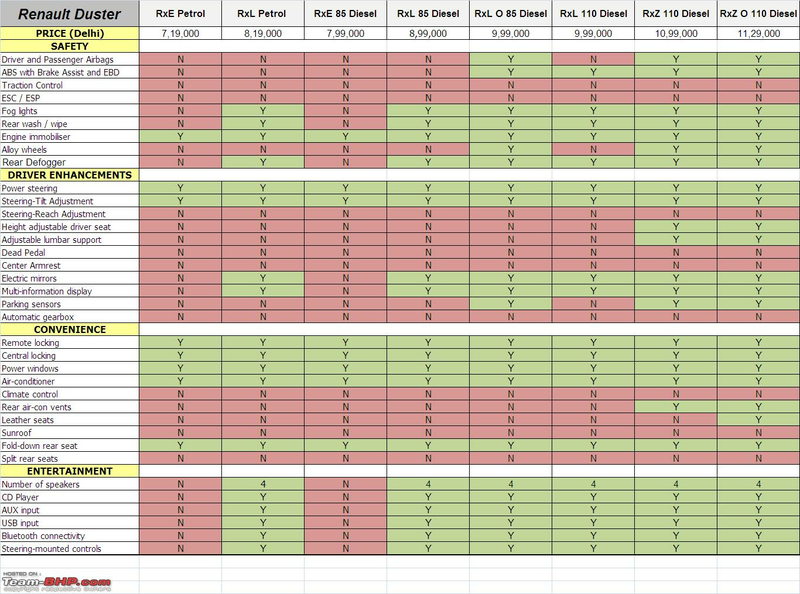 8 variants & 3 engine options cover price points across the market spectrum. The Duster's price intentionally overlaps with B segment hatchbacks, C segment sedans and million rupee UVs. I find the petrol & 85 PS diesel to be reasonably priced. It's a hit and miss with the variants though. No surprise as Renault has a history of missing the mark with equipment levels (remember the stripped down Fluence Diesel @ Rs. 15 lakh?). The company expects the petrol engine to account for merely 5% of sales, 7% at best. Still, it's inexplicable that you can't buy a Duster petrol with ABS & airbags in India. 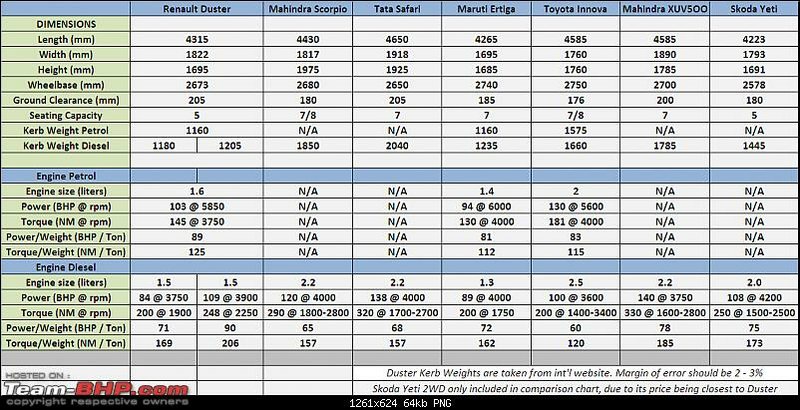 The 85 PS diesel should account for a majority of the Duster sales; the low & mid variants do offer most value for money. Considering its pricing though, the 85 PS RxL should have had at least ABS as standard. The 85 PS diesel doesn't get a fully-loaded variant with seat height adjustment and rear air-conditioner. The 110 PS Duster RxZ does have these features, but it's clearly overpriced by ~50 - 60K. The RxZ's on-road price veers dangerously close to the bigger, more powerful XUV500 and the brilliantly packaged Skoda Yeti. We can only hope that there is some shuffling of equipment levels in the future. 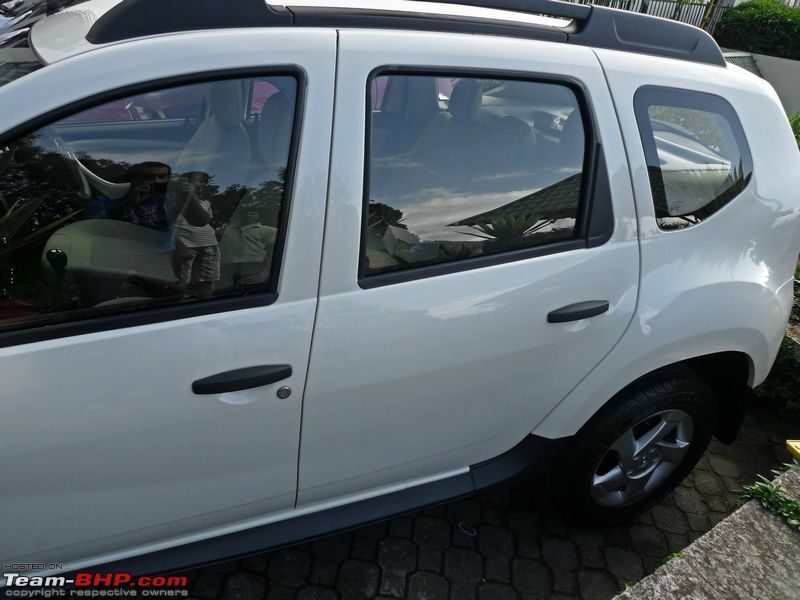 Renault has no plans of selling the Duster 4x4 in India, even though the same will be exported. A Duster AT Diesel could make for a great market opportunity, but the sole AT gearbox that the Duster has internationally is mated to a petrol engine. Ingress is easier than in the lower slung sedans. The elderly will surely appreciate the higher placement of the Duster's seats. However, egress from the back seat isn't as simple. 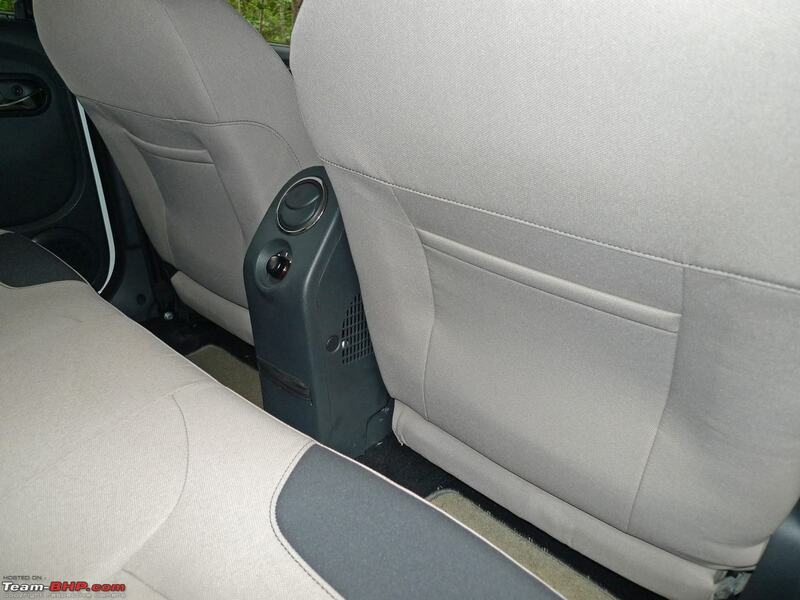 The gap between the large rear seat & the B Pillar is limited, thus interfering with an effortless exit. 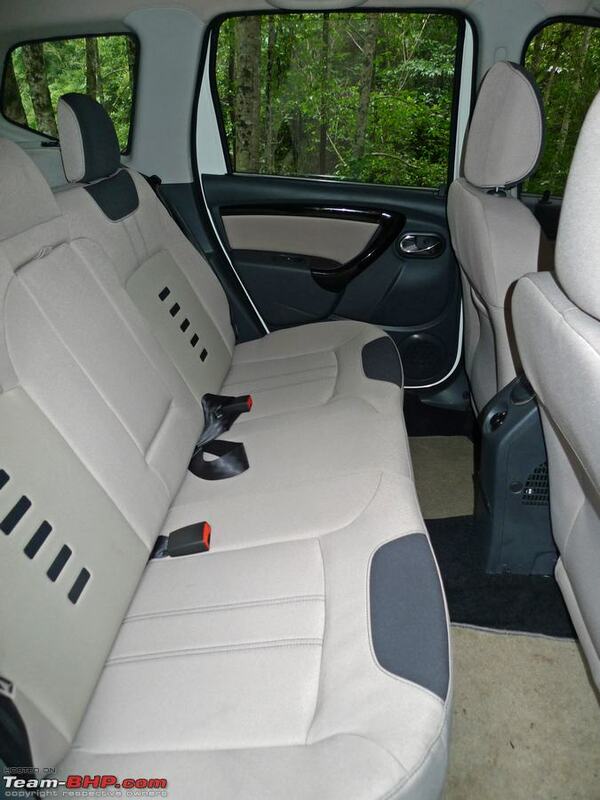 Slide inside the Duster and you'll immediately notice the bright, airy ambience. The large greenhouse allows a lot of sunlight in. In terms of look & feel, the interiors are all function and no form. The overall design is uninspiring; it's liveable, yes, but there is no “wow” factor at all. 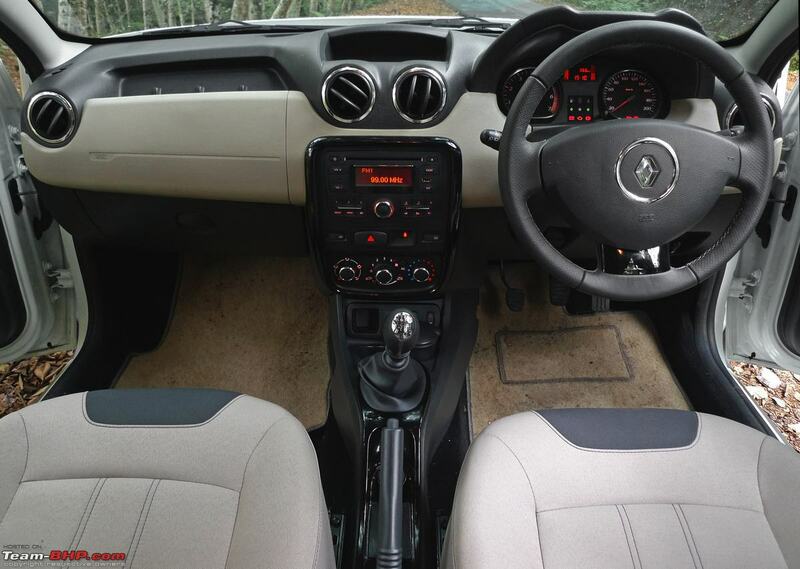 You'll be happy or unhappy with the interiors, depending on what class of vehicle you are comparing the Duster to. Scorpio, Safari or Xylo? The Duster blows them away. Interior quality is at least 2 levels superior to what the home-grown MUVs have to offer. 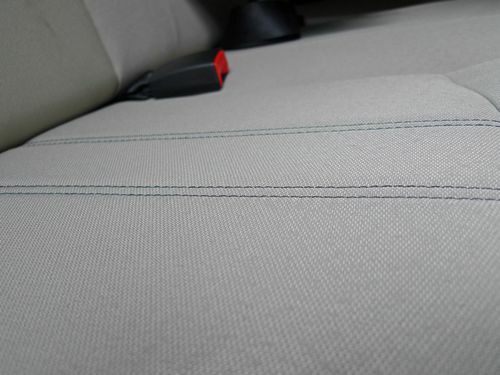 The Duster feels far more contemporary on the inside, while fit & finish are much superior too. On the other hand, if you are cross-shopping with equivalently priced sedans (like the Vento or Verna), the Duster's interiors will fail miserably. There is an abundance of hard & shiny plastics here. None of the parts feel particularly worthy of a million rupee car; the quality is more in line with entry-level sedans than the likes of the Honda City. Unlike the exteriors, cost cutting is extremely obvious on the inside. 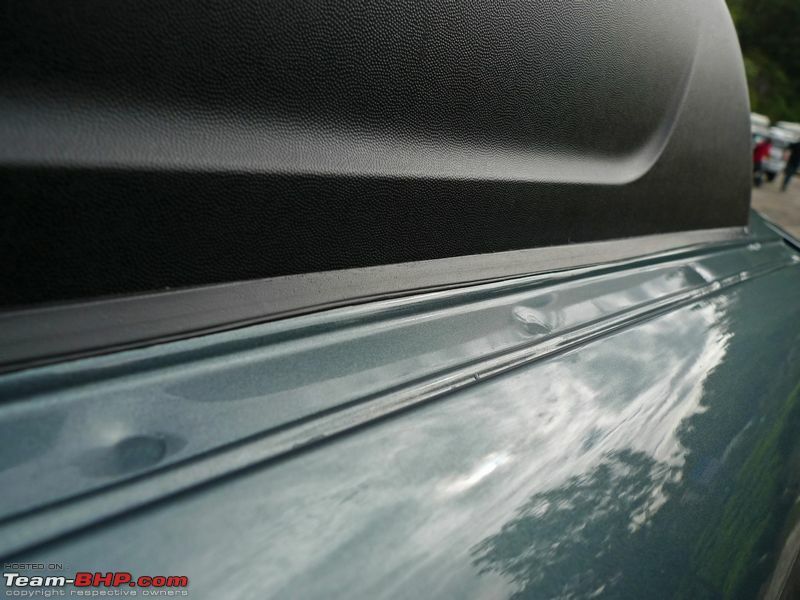 For instance, the rubber beading wouldn't look out of place on a humble Maruti WagonR. 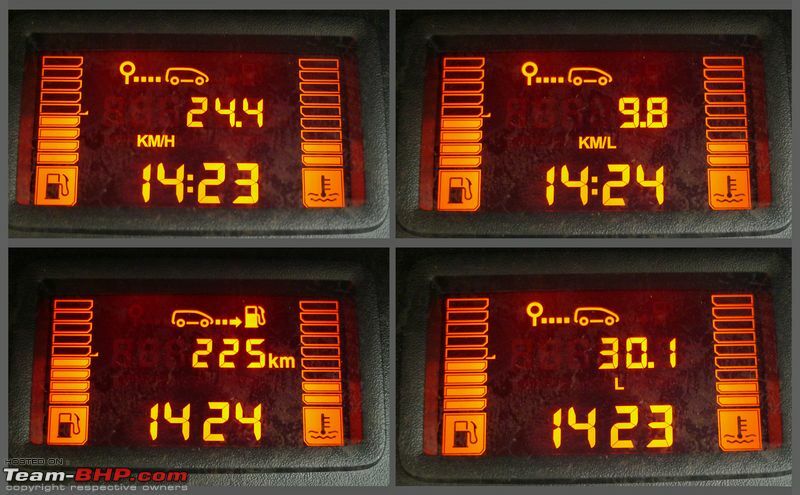 The switchgear is economy-grade and the 7,000 rpm counter is common to the petrol & diesel variants (no redline marked). Feel closely and you'll notice a lot of flimsy parts and panels with rough edges. It appears that the purchasing department exhausted its budget on the exteriors & mechanicals, and were left with little by the time they got inside. On the positive side, I found the colour combination to be very tasteful. The black, beige & cream colour combination works, while the piano black & chrome touches are thoughtfully applied. 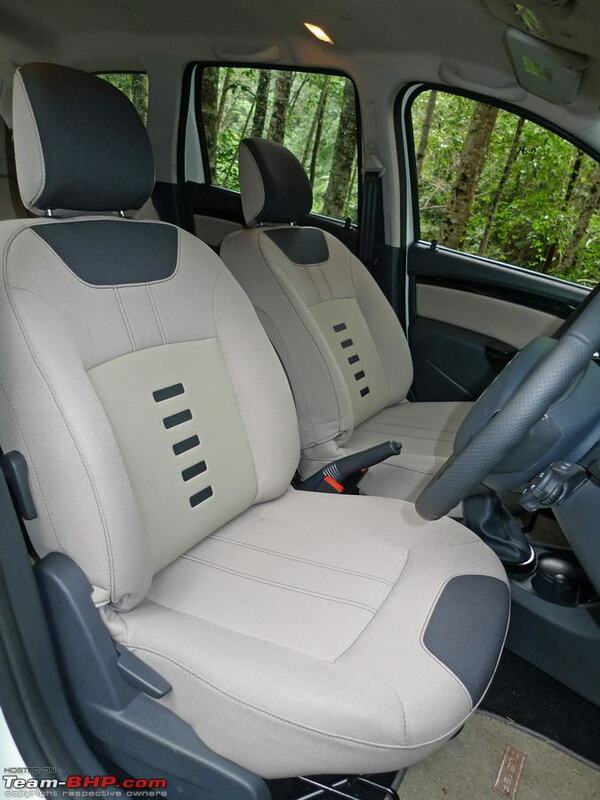 They play their part in improving the feel of the Duster's interiors. In full grey, this interior would have looked right out of the nineties (Logan memories are afresh). Which reminds me, I prefer the Duster's interiors to that of my Nissan Sunny. In summary, those who buy the entry & mid-variants for 8 - 10 lakhs will learn to live with it. But customers spending 12 - 13 lakh for the higher 110 PS Dusters will inevitably feel short changed. Space for front seat occupants is A+. The Duster has reasonable width on the inside and the driver won't be elbowing his co-passenger much. Also, the glove box doesn’t interfere with the front passenger's knees. Headroom is just about enough, although it isn't excessive as in other SUVs. The front seats don't get much in the way of bolstering. They are on the flatter side and under-thigh support, especially, is lacking. I liked the fabric seat upholstery. The compound isn't too firm and feels durable. 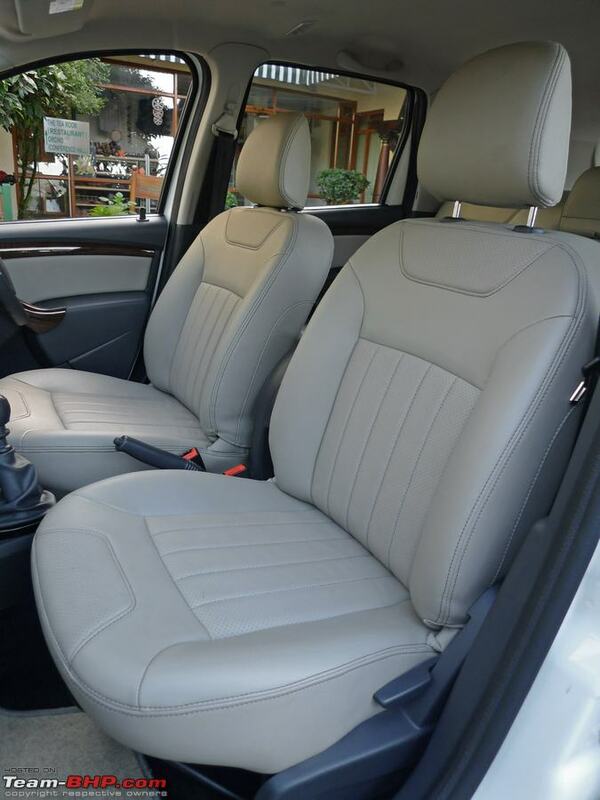 Actually, I prefer the Duster's fabric upholstery to the economy-grade leather seats offered on the topmost variant. The front seats get a rating of 7 / 10 from me. 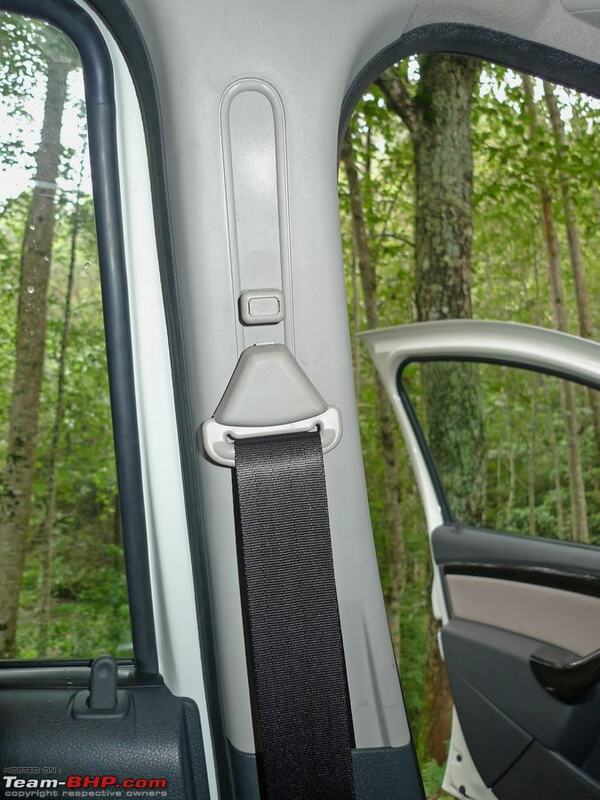 All 4 doors offer a comfortable place to rest your forearms on the move. That said, a center armrest for the driver is sorely missed, especially since the competing Scorpio offers a wonderful center armrest for the driver & co-passenger (each). 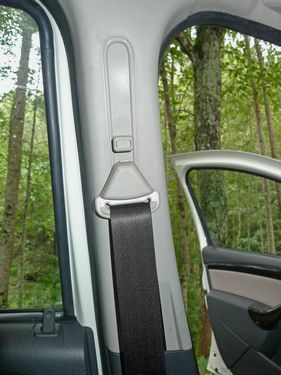 The front seat's fore & aft adjustment range is long enough to accommodate the shorter as well as taller drivers. The driver's chair gets adjustable lumbar support as well. The setting is progressive and provides you with adequate lower back support. If you want to increase the seat height, you have to get off and pull on the bare metal lever (no plastic cladding). Of course, you can lower the height while being seated. It's a rudimentary procedure and just one of the many areas in which cost-cutting is obvious. On the bright side, the seat height adjustment has a good range. 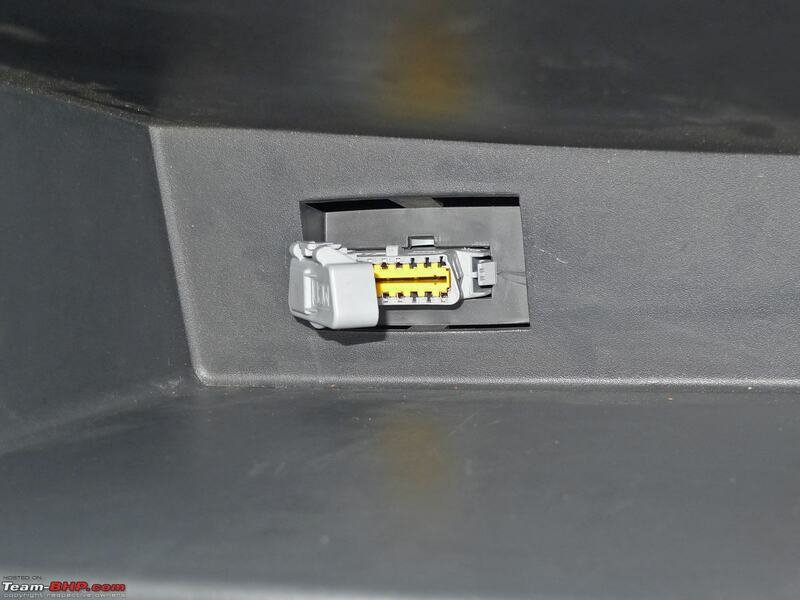 Short drivers will need this feature; even though the dashboard is placed on the lower side, the top of the instrument console will interfere with their line of sight. Frontal & lateral visibility are superb, and rearward view isn't too bad either. 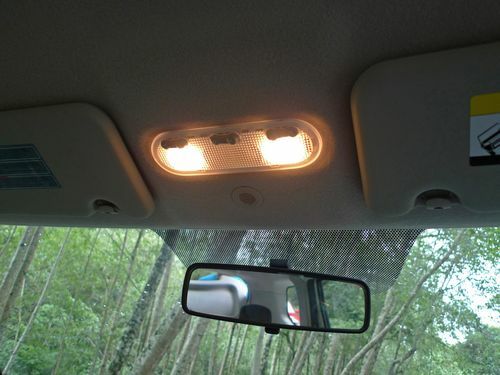 Whatever the reason may be, some folk will appreciate being able to "see the bonnet" while driving. The steering gets tilt adjustment only (reach is fixed). I found the horn pad to be unnecessarily large, even if it makes honking easier. As a result, the gaps in the lower half of the steering are too small. When cornering, I was unable to make much use of the steering's bottom half. I'm going to go against the tide by saying I actually liked the placement of the audio controls (behind the steering, to the right). I prefer my steering wheels to be just that, and don't like the clutter that integrated audio & phone controls bring. Drive the Duster for a while and you'll agree that the audio controls are intuitive to use. Their el-cheapo build quality leaves a lot to be desired though, with the audio buttons of our brand new test car suffering from excessive play. I could write a book on the messy ergonomics : Power window buttons are thankfully placed on the driver's door (remember the Logan's controls? ), but the console on which they are fitted looks like an after-thought. Most of you will need to really stretch to access the buttons which are placed all the way at the start of the door. The sharp edge of this console poked my right leg a bit too much while driving. 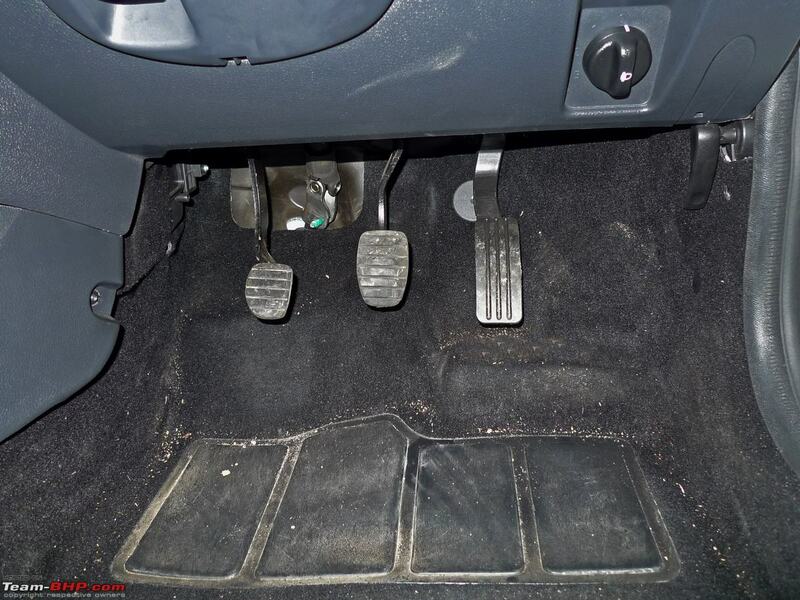 The clutch, brake and accelerator pedals are awkwardly positioned, and are also too close to one another. There's no dead pedal...placing my left foot in the available space (to the left of the clutch) was tricky with large shoes. 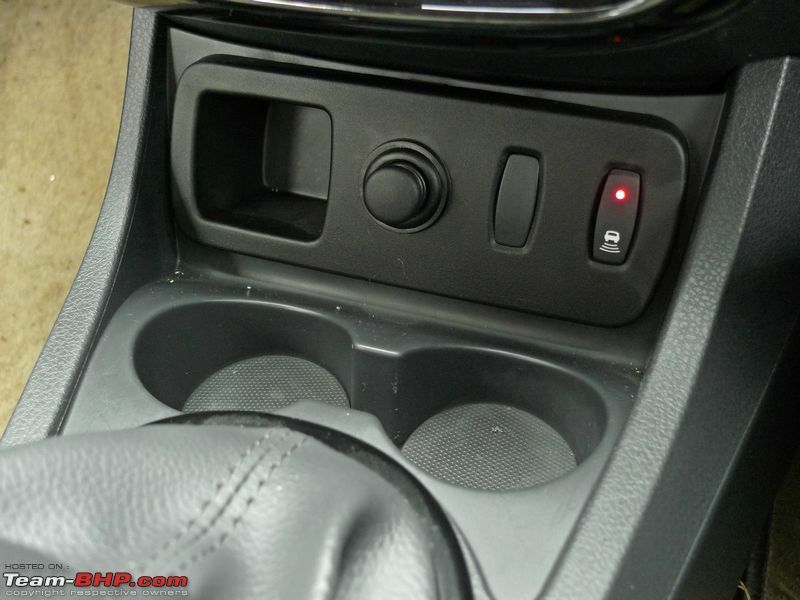 The ORVM adjustment knob is strangely located below the handbrake. 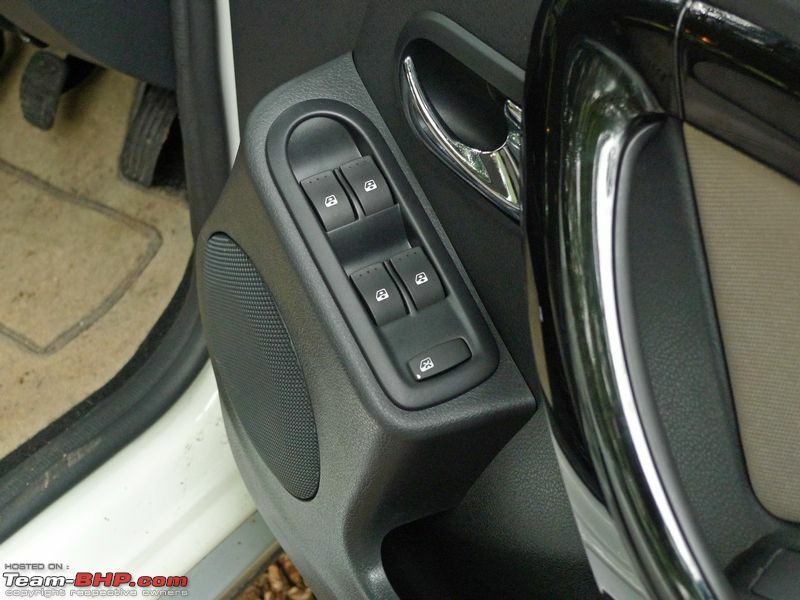 Then, the center console angle & the tiny central lock / unlock button are geared for left-hand-drive variants. Ergonomically, the Duster misses the mark by a mile. Try as I might, even after spending 2 days with the SUV, I just couldn't find my "ideal" driving position. Every hour or two, I'd fidget with some seat setting or the other. The Duster is simply not as user-friendly as the typical Japanese or Korean car. 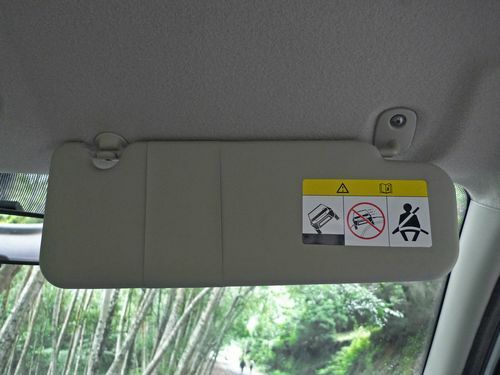 In fact, the only other car in which that ideal driving position remained elusive is the Fiat Linea. Even though the Duster is built on the Logan’s platform, it doesn't offer the rear legroom of its sedan sibling. To put things in perspective, legroom is similar to a Hyundai i20 rather than the Honda City. I'd term it as strictly adequate; it's not what I would call spacious, but neither is it too cramped. The back of the front seat is scooped in to liberate that much more knee room. Where the rear bench scores is in support & sheer width. The seat back is superbly reclined, making the bench a comfortable place to relax on. Also, the center armrest is great to use. 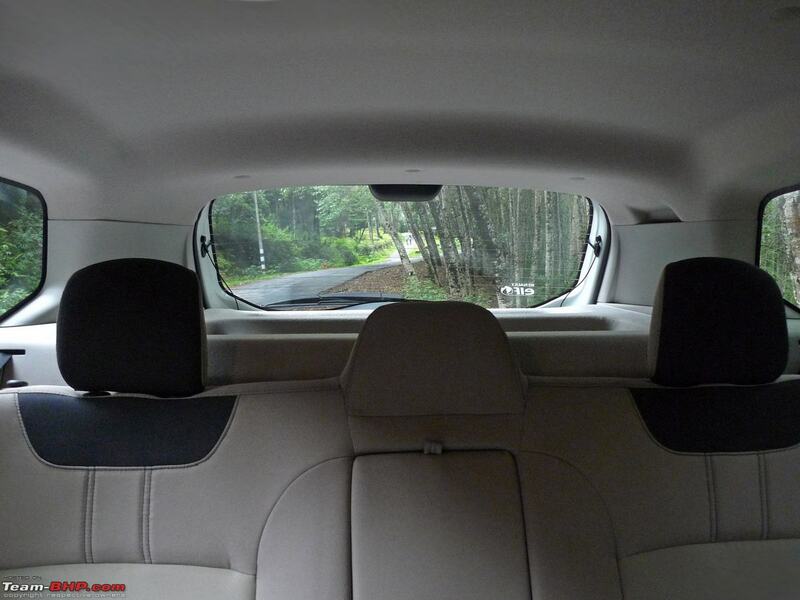 The rear seat is positioned noticeably higher than the front; this, combined with the large windows, makes for a bright ambience. It's not claustrophobic at the back at all. 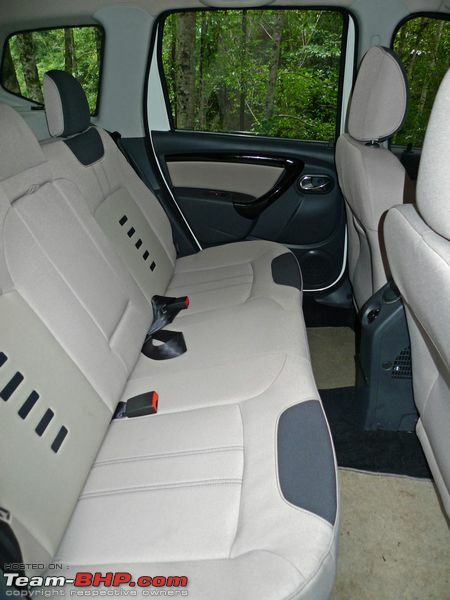 The rear seat is wide enough to easily accommodate 3 passengers. The India-specific rear air conditioner looks like an after-market fitment though. It's placed too close for comfort to the rear seat. The 5th passenger will have to twist & turn his legs before being able to sit in the middle. That said, he won't have any problem once he is seated (contrary to popular perception). I sat as the 5th passenger for a couple of kms and didn't have any complaints. The 5th passenger's seatback - which is the base of the center armrest - is soft and provides adequate cushioning. 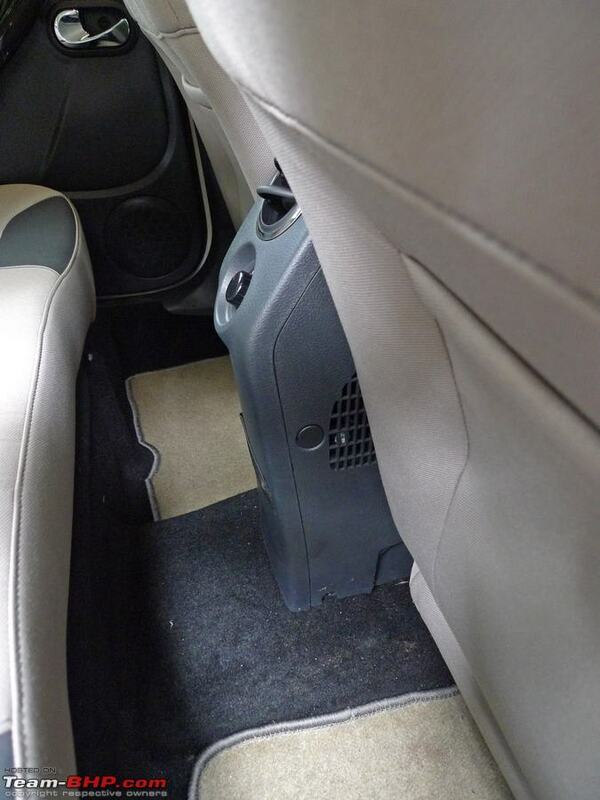 The rear air-conditioner has its own condensor and is extremely effective, unlike the Nissan Sunny's meagre air blower. 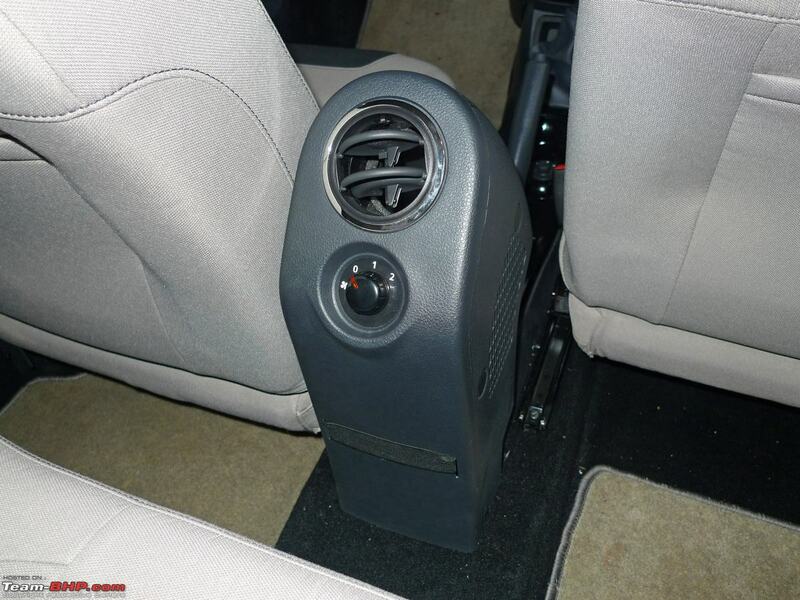 At speed II, it can chill the Duster's rear section in no time, despite having only a single air vent. Do note that speed II is pretty noisy. You might want to switch back to speed I after the desired temperature has been reached. 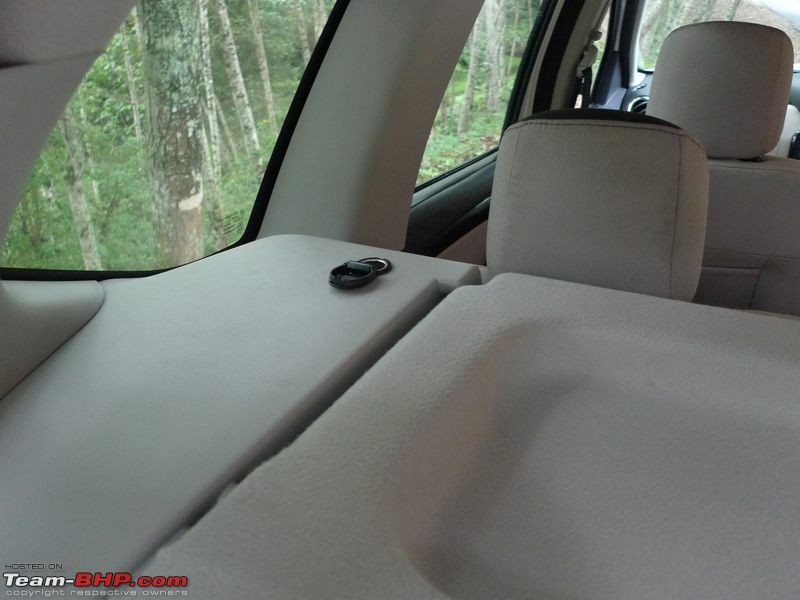 The planted ride quality improves overall comfort levels for rear passengers. The body roll is well in control and I'd much rather be seated on the backseat of a Duster than a shaky Xylo. The single fly in the ointment is the limited legroom, something Renault could have easily solved by equipping the Duster with a sliding rear seat. 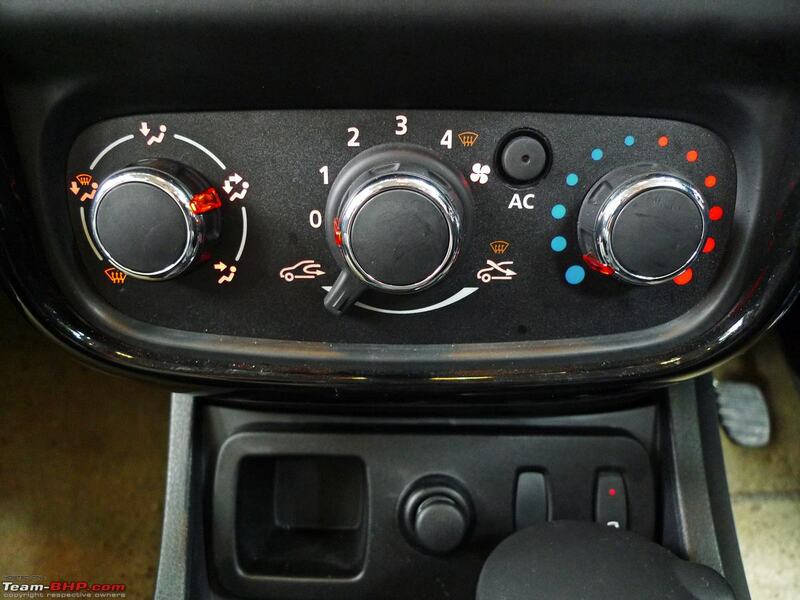 Such small additions make the difference between an "average" and "intelligently" packaged interior. After all, what do you use more? 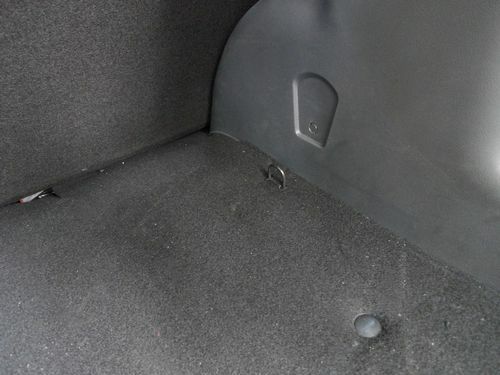 The rear seat or the boot? Why not leave it up to the owner to decide? 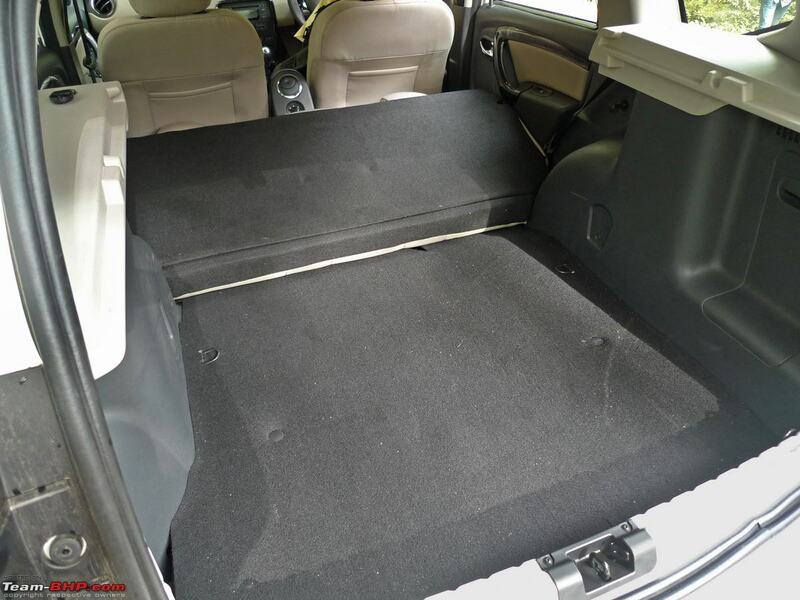 A number of market successes have proven that the Indian customer prioritises rear seat space over luggage capacity. 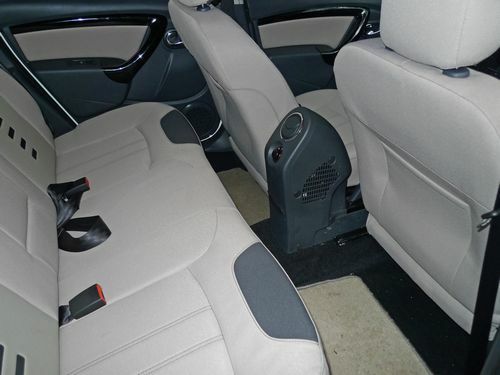 At the very least, the rear seat should have been positioned further back to release more legroom for passengers. 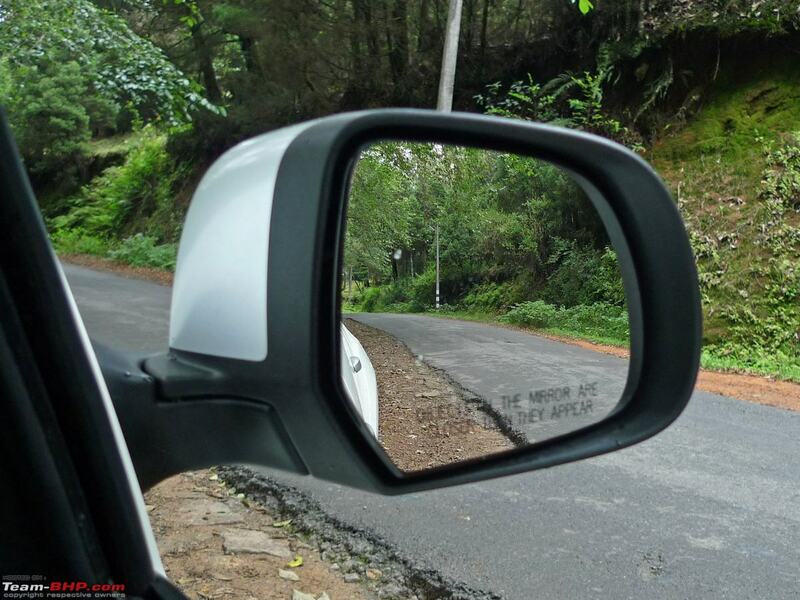 The 2nd day of our test-drive included a drive on the Coimbatore highway. The Duster's air-conditioner seemed up to the task of keeping the cabin cool under a hot sun, although rains were intermittent and I'll leave the final verdict to Duster ownership reports. We had only the front air-con running most of the time and I doubt anyone will miss the rear unit. The OEM stereo has mediocre levels of sound quality, thanks to the budget quality speakers. If you care even a little bit about audio quality, upgrading the speakers might be a good idea. There is a fair amount of storage space at the front. 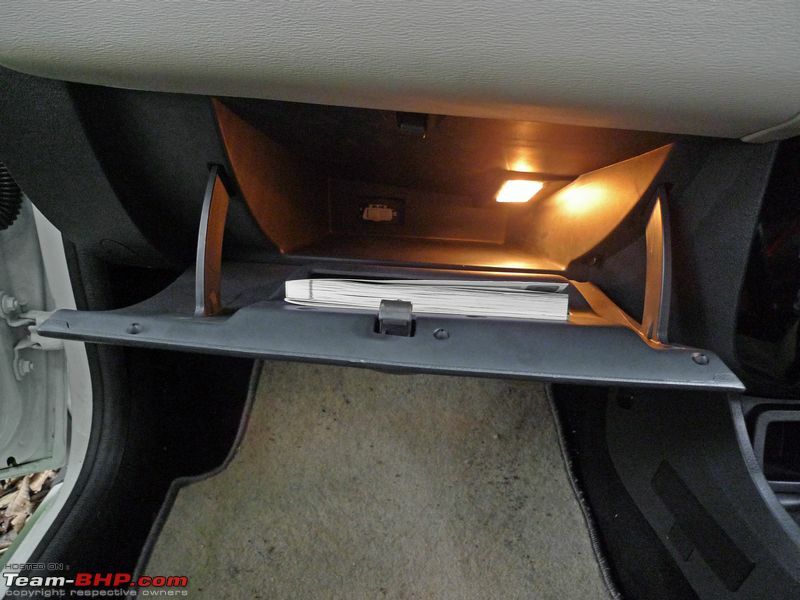 The glovebox runs deep and is illuminated. 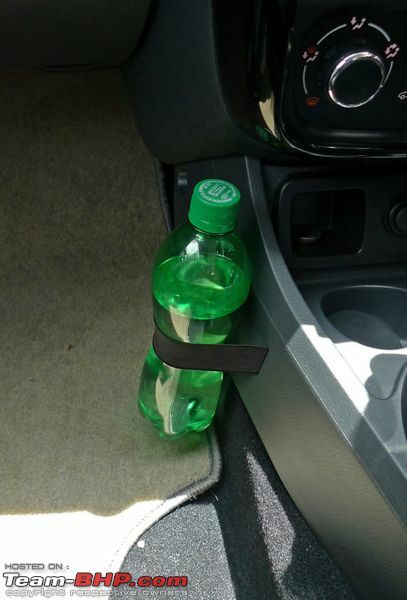 The door pockets are deep as well, and can hold 1 liter bottles. Be warned that the mouth (of the door pockets) is quite narrow and the rough edges can scratch your hand. 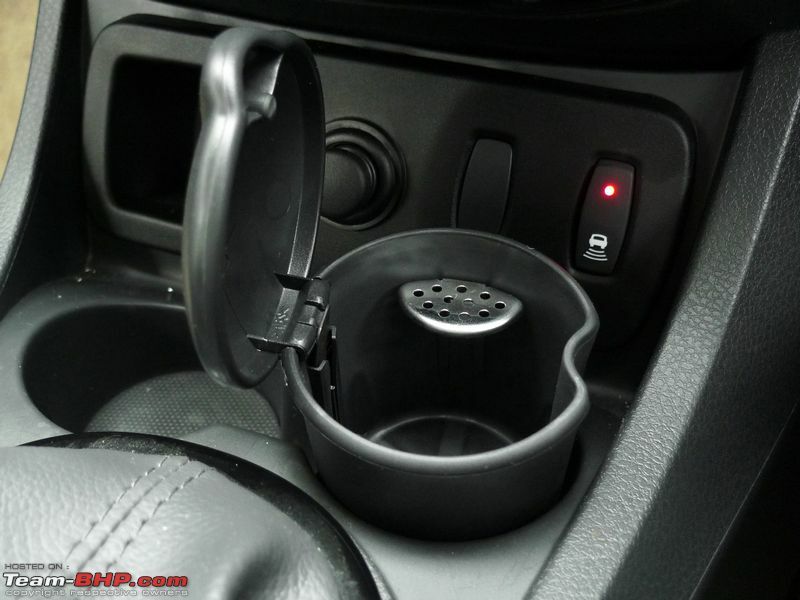 There are two small cup / can holders right ahead of the gear lever. 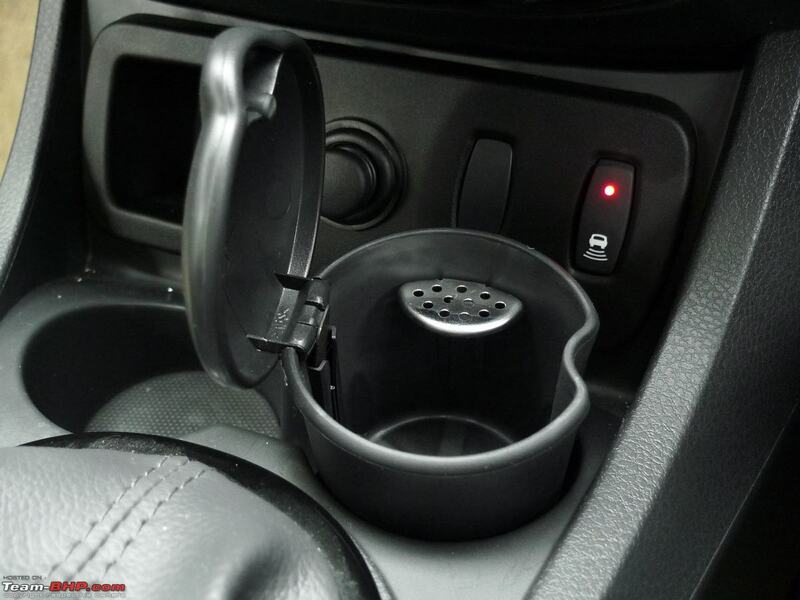 The dashboard has accommodating storage cubicles above the center air-vents and the glovebox. 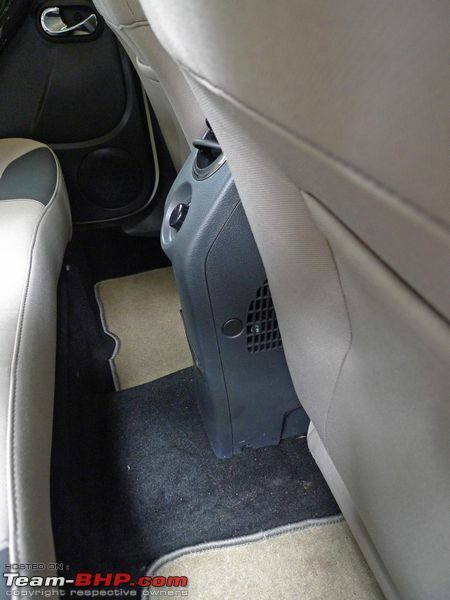 I found the cubicle below the handbrake perfect to park my smart-phone. It also has borders that ensure your phone doesn't slide out under hard cornering. Rear passengers don't get door pockets, although there are two seat-back pockets (on the front seats). 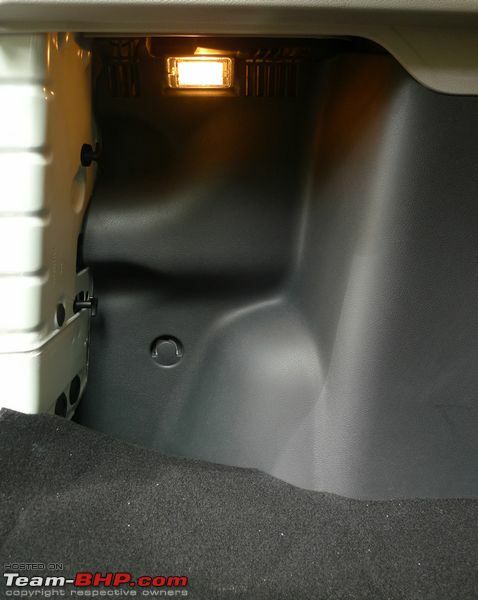 The 475 liter boot has a practical layout and the loading lip isn't too high either. 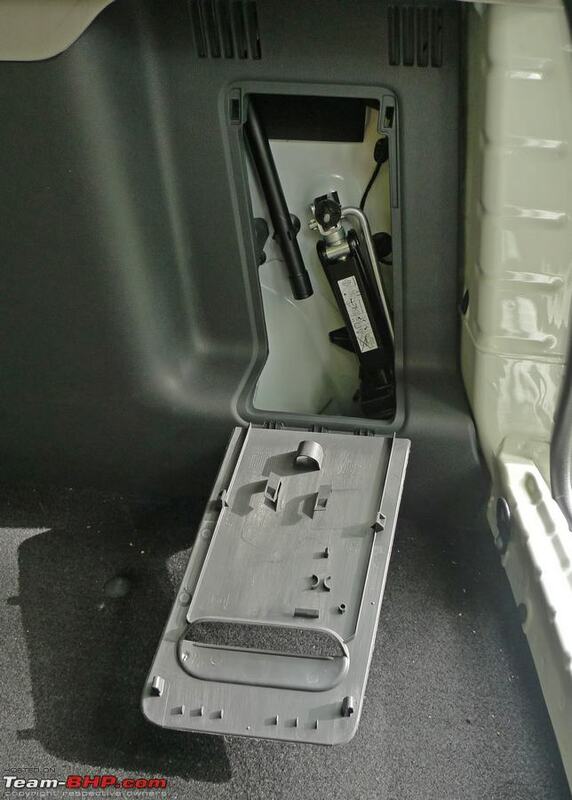 The twin-tray parcel shelf can hold knick knacks in place. The parcel shelf will also come in handy to hide shopping bags from prying eyes. 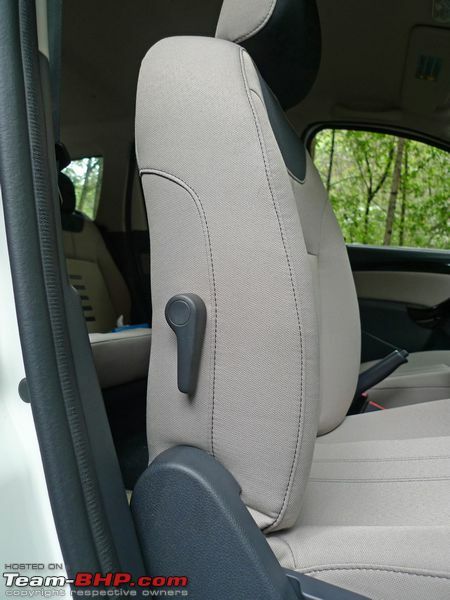 I am at a loss for words why the folding rear seat doesn't have a 60:40 split option. This greatly limits cargo flexibility. My unscientific opinion is that a split seat would be used a lot more in lifestyle SUVs than hatchbacks or sedans. Going against the tide, I actually prefer this placement of the audio controls (behind the steering wheel). Extremely intuitive to use. 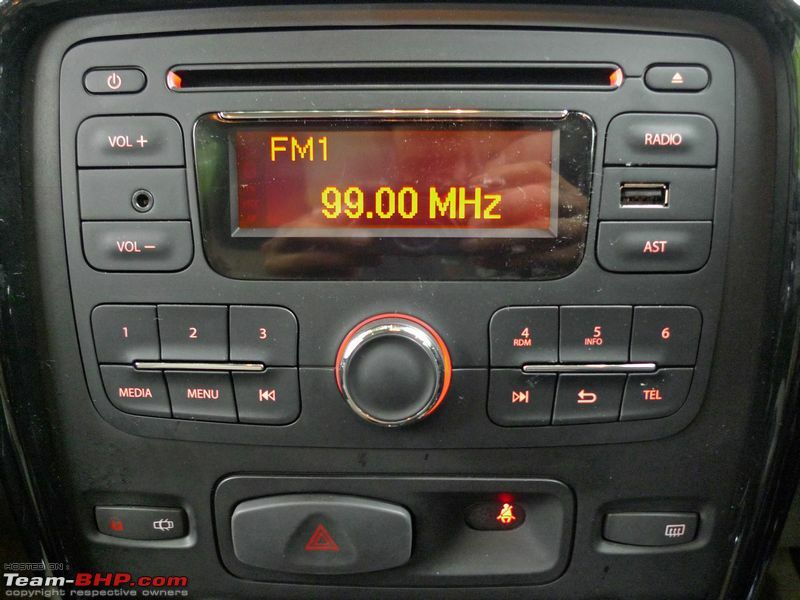 It's a full feature module with controls for choosing the media type, radio stations, mute button, phone control etc. Ordinary meter console is common to petrol & diesel engines. No redline marking on tachometer! The Renault Duster has three engine options; two 1.5L diesels and one 1.6L petrol. Both the diesel variants have the same engine, albeit running in different states of tune. The 84 BHP 1.5L engine has a fixed geometry turbo while the higher powered 109 BHP diesel gets a variable geometry unit. This K9K turbo-charged common-rail diesel is the runner-up for the National Engine of India title (currently bestowed to the Fiat 1.3L MJD). 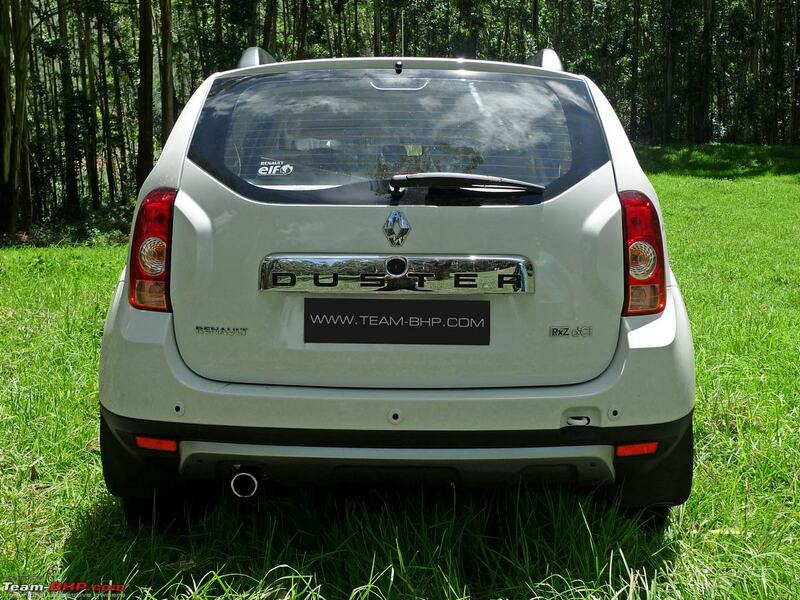 The K9K powers the Logan, Sunny & Fluence sedans, the Micra & Pulse hatchbacks and now, the Duster SUV. This SOHC 8 valve powerplant is old-school...it's nowhere as contemporary as the Fiat 1.3L DOHC 16v MJD that powers so many Indian cars today. Nevertheless, the engine is an acknowledged workhorse known for its durability and high fuel efficiency. 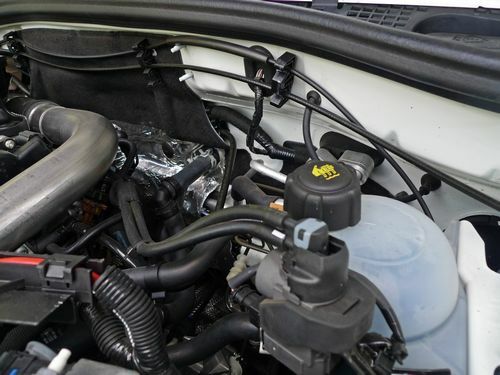 The Duster 110 PS engine makes 109 BHP (@ 3,900 rpm) and 248 Nm of max torque (@ 2,250 rpm). 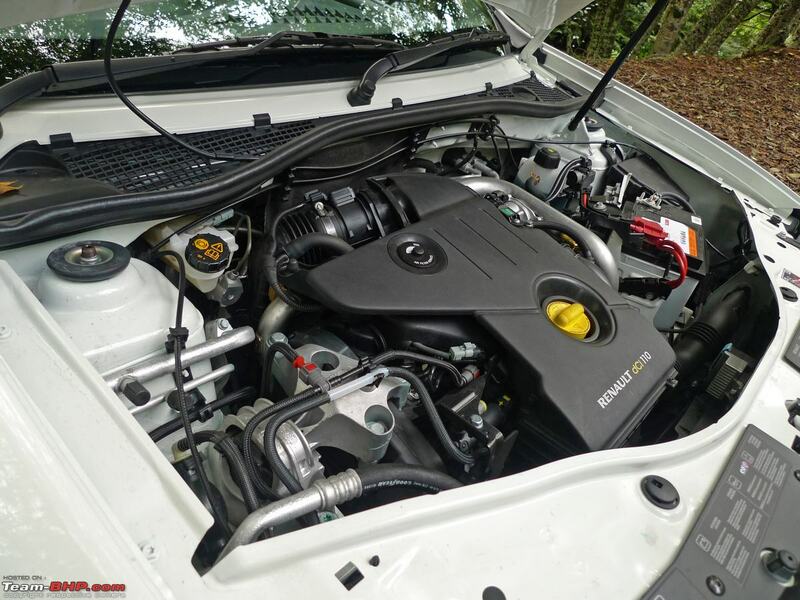 The Fluence recently received an engine update that results in lesser turbo-lag and max torque at lower rpm. I find it peculiar that the Duster - Renault's most important product today - doesn't get that version. Start the Duster and the motor sets into a refined idle. Renault has put in hard work on the Duster's NVH and it shows. Even at higher rpms, the Duster is far more refined than my Nissan Sunny (running the same engine). It's sufficiently smooth and at cruising speeds, passengers won't even know there is a diesel under the hood. Overall engine refinement is top class. There is a bad amount of turbo-lag below 2,000 rpm, and the 109 BHP Duster only gets punchy above 2,200 rpm. The lag won't bother you much when starting off from a standstill, thanks to the short 1st gear ratio. However, it can seriously catch you out if you try to drive around town at low speeds in 2nd gear, or on inclines. The only solution is to downshift and get that engine into the turbo zone. For the same Munnar incline that our Innova cab did in 2nd gear, the Duster required a firm downshift to 1st. I had to make frequent downshifts in slow moving Kerala traffic that was reminiscent of Mumbai rush-hour conditions. It does take a couple of kms to get used to the lag and learn to drive around it. I wouldn't consider the lag a deal breaker, though the 84 BHP Duster offers far superior driveability in town. The 110 PS' turbo is unforgiving and you have to pay attention to choosing the right gear at lower speeds. In comparison, the 84 BHP Duster lets you get away with a less attentive style of driving. Keep the engine on the boil and the 109 BHP Duster will reward you with brisk performance on the open road. 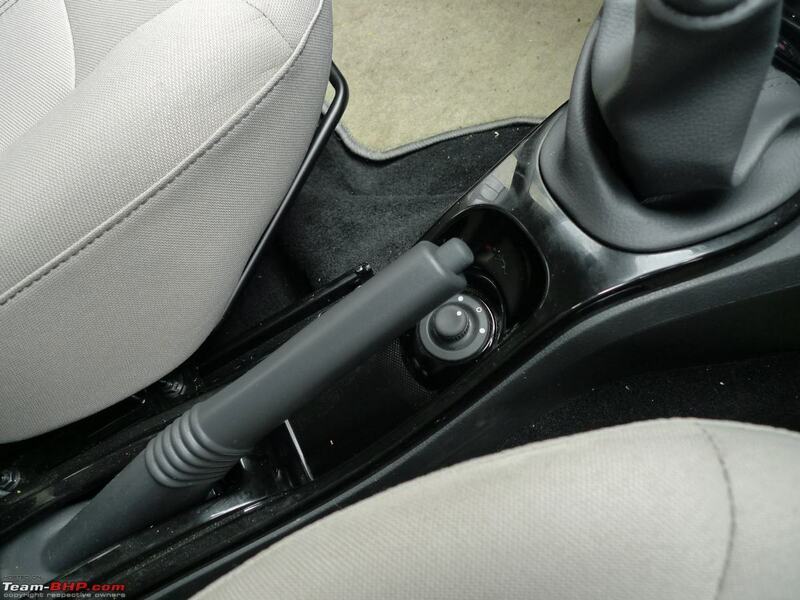 You need to firmly hold the steering as torque steer does set in under hard acceleration. When the turbo kicks in, you feel a mild boost and the engine accelerates clean thereafter. 3rd gear was a vital tool on Coimbatore single lane highways, and overtaking other traffic was effortless due to the punchy mid-range power delivery. 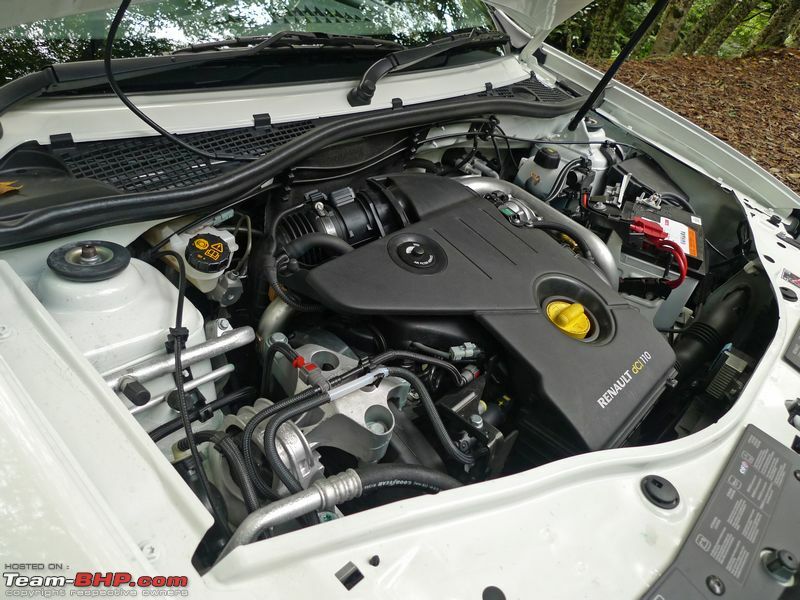 This 1.5L diesel feels best between 2,300 - 4,000 rpm, after which there isn't much progress. The engine will revv to 5,000 rpm when required, but you'll do well by upshifting at 4,000 rpm tops. 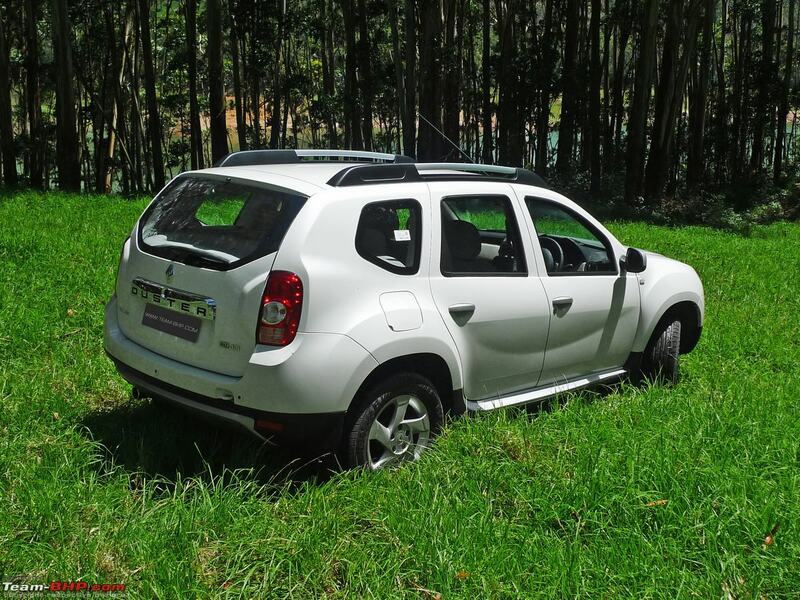 The Duster 110 gets a 6-speed manual gearbox that makes for relaxed expressway cruising. 100 kph in 6th gear sees the engine spinning over at 2,200 rpm and right in turbo zone. The gearbox's throw is longer than I prefer, while shift quality does have a rubbery side to it. The box has well-defined gates though and is eager to slot; not once did we mis-shift over the 2 days of driving in varied conditions. 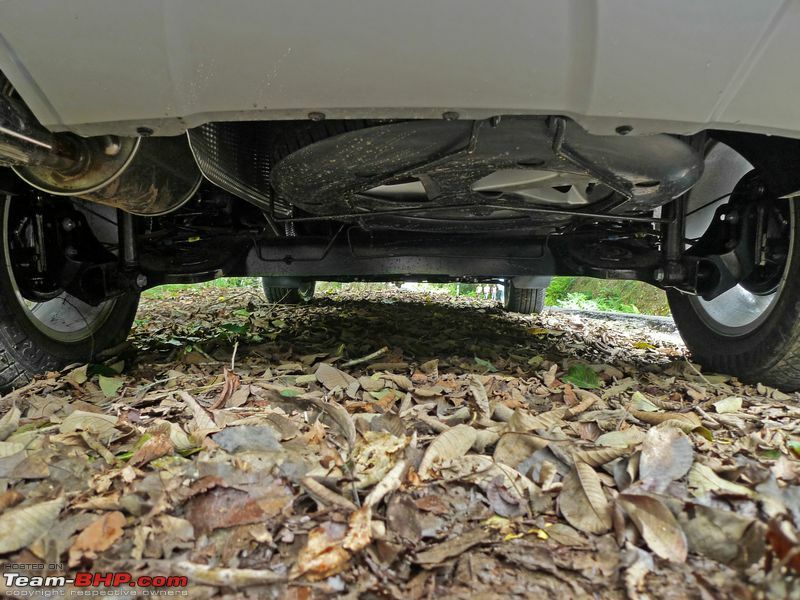 The clutch on the Duster 110 PS is unnecessarily firm and has an aggressive bite too. It does require an effort to operate. This will definitely be a source of complaints in bumper-to-bumper traffic conditions. As mentioned earlier, the engine's NVH levels are outstanding. 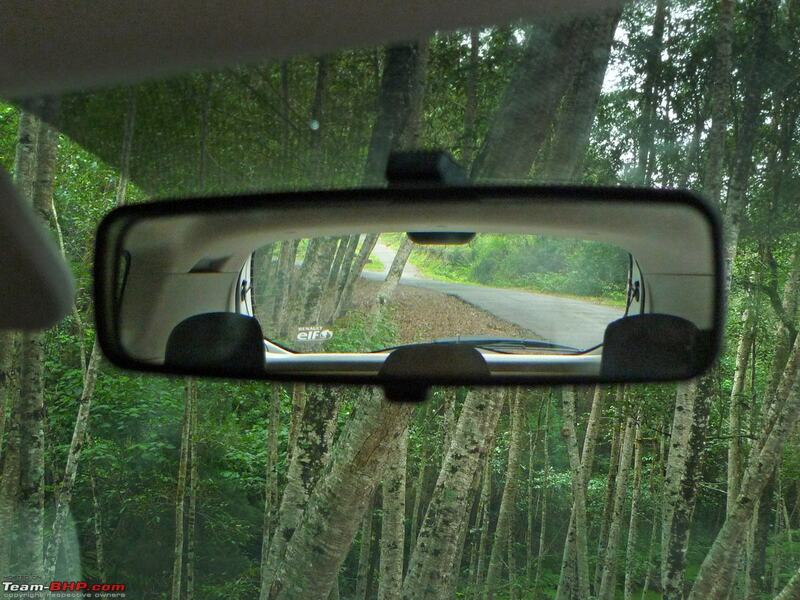 In your daily drive with the windows up and the air-conditioner running, you will barely hear the diesel engine. However, wind noise is terribly prominent. 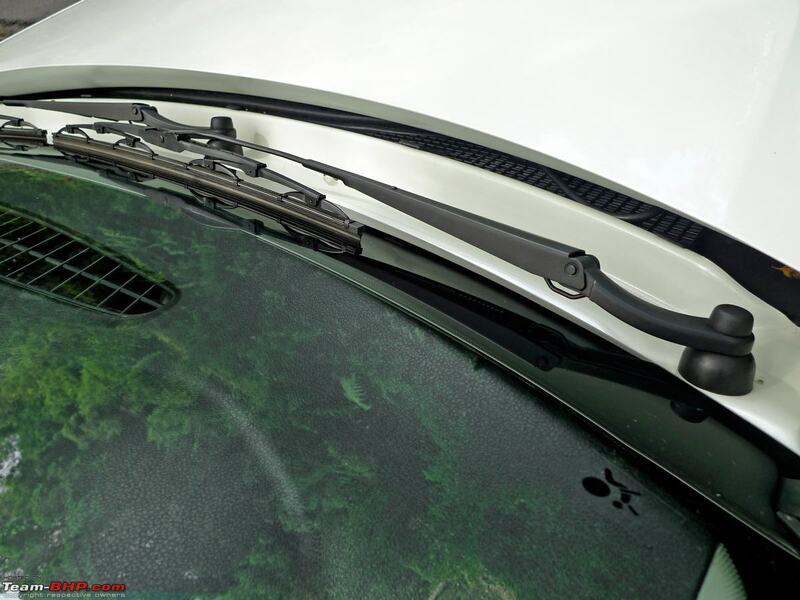 At speeds as low as 80 kph, you can hear significant wind turbulence from the A-Pillar area. The sound is annoyingly similar to when one window is left slightly open at speed. The Duster 85 variant churns out 84 BHP (@ 3,750 rpm) and 200 Nm of max torque (@ 1,900 rpm). It runs nearly the same tune as the Sunny’s version of this engine. The two main differences are that the Duster makes 1 BHP less and max torque at a 100 rpm lower than the Nissan. 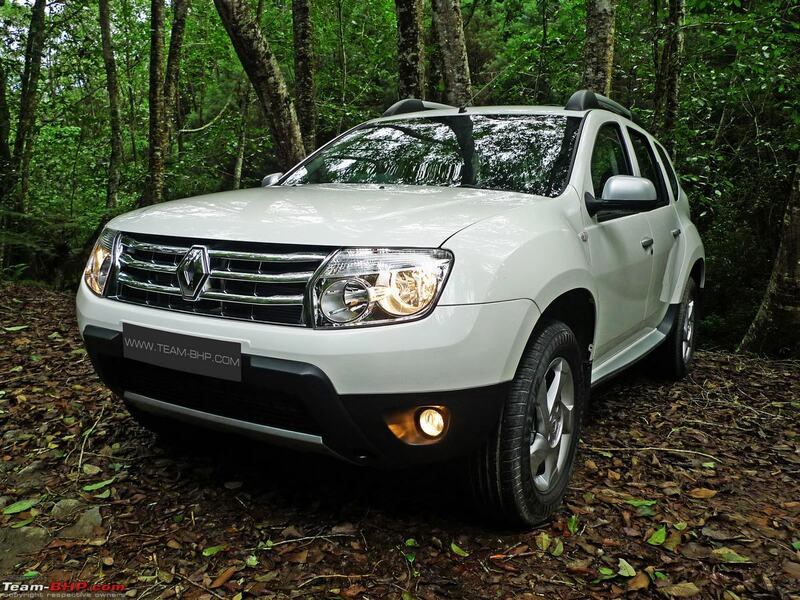 Compared to the more expensive 110 variant, the Duster 85 has 25 BHP & 48 Nm of torque less. Is the Duster 85 underpowered then? Not at all. Its power / weight and torque / weight ratios are still superior to the Scorpio, Safari and Innova – thanks to a lighter kerb weight. Further, the power ratios are about the same as the Maruti Ertiga, and within 10% of the more expensive Mahindra XUV500 and Skoda Yeti. As expected, the Duster 85’s USP is the outstanding in-city driveability on tap. 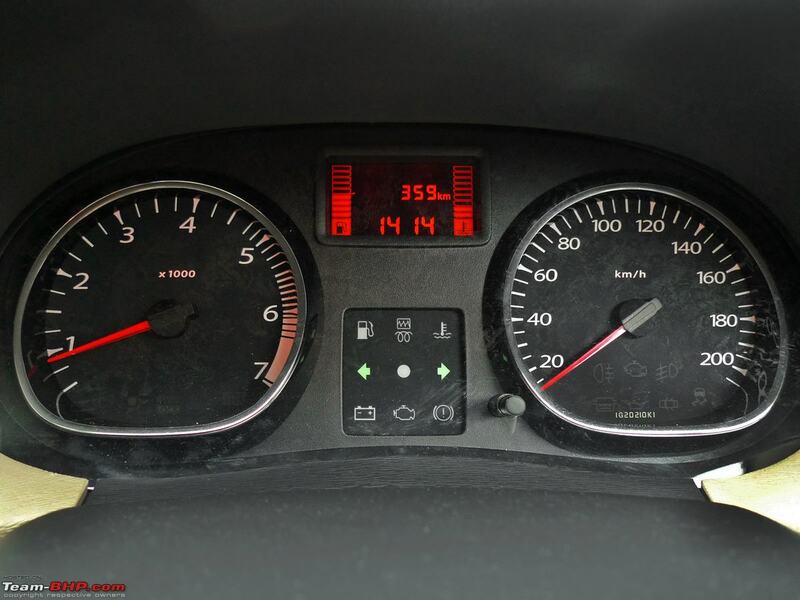 Turbo lag is too negligible to mention, with the engine feeling immensely tractable. While the Duster 110 only really wakes up after 2,000 – 2,200 rpm, the Duster 85 pulls clean from as low as 1,200 rpm. The engine behaves like a naturally-aspirated diesel! Translated, you’ll seldom need to downshift within the city. 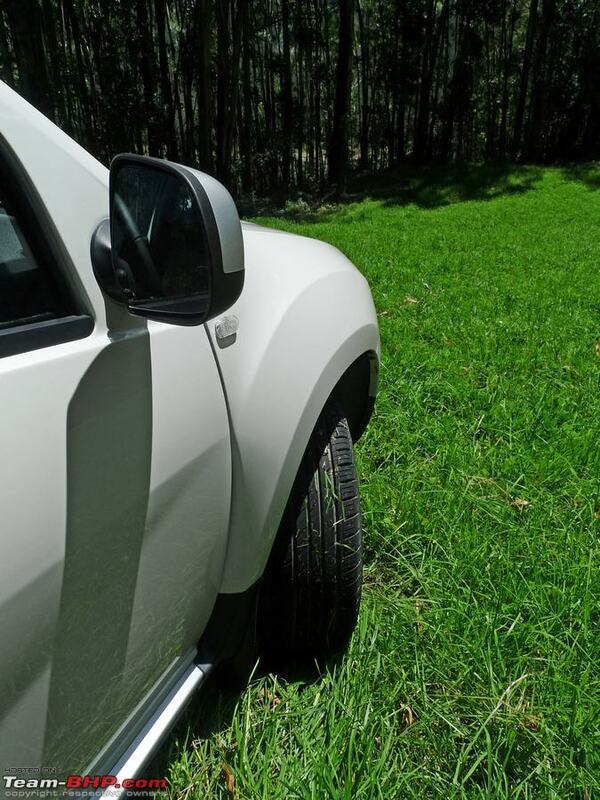 The Duster 85 passes the 2nd gear speed-breaker test with flying colours; it is even possible to drive away from 0 kph in 2nd gear, with just a little clutch slip. BHPian Parrys didn’t face any problem in climbing city flyovers in 5th gear itself. In traffic conditions that the Duster 110 would require frequent downshifts, the 85 happily rolls along in the same gear. 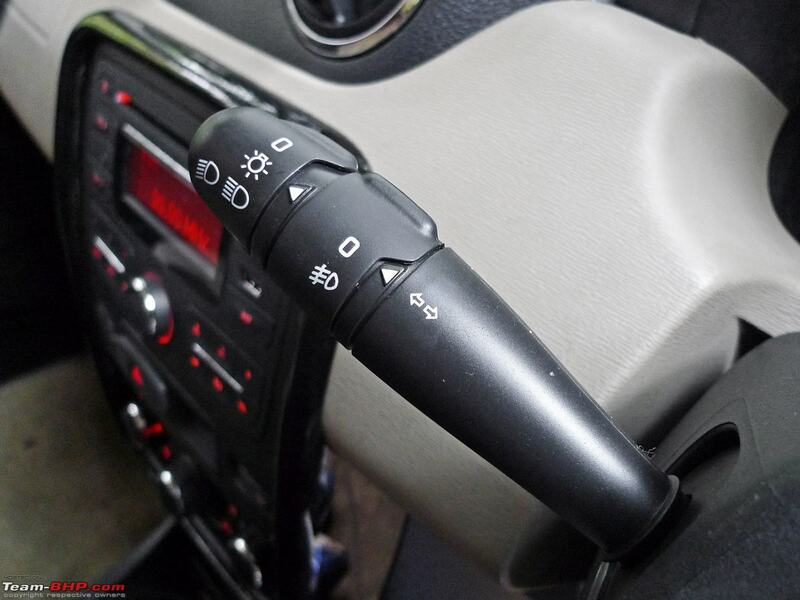 You can use the versatile 2nd or 3rd gear (choice dependent on traffic speed) just like an automatic. With liberal usage of the accelerator pedal, the Duster 85 is reasonably peppy in the city. That said, it somehow doesn’t sprint as fast as the Sunny Diesel. Power delivery is fairly linear, but the 110’s mid-range punch (and initial torque steer ) is missing. The 110’s highway performance is noticeably superior. With the 110, you have a decent amount of reserve power in most highway conditions; this isn’t the case with the 85. Don’t get me wrong, the Duster 85 isn’t under-powered. Performance is completely satisfactory up to 120 – 130 kph, only after which power delivery starts tapering off. The engine doesn’t enjoy spinning over 4,000 rpm either. Since the motor runs out of breath sooner, the 85 is best suited to a sedate driving style on the expressway...the same conditions where its more powerful sibling runs like a horse. Anything that the 85 does on the open road, the 110 does better (as long as the needle is hovering over 2,000 rpm). With a full load of 5 occupants and luggage onboard, the difference between the two will be even more. The Duster 85 gets a 5 speed gearbox (unlike the 110’s 6 speed) and therefore, 100 kph cruising comes at a higher 2,400 rpm. On tight & twisty ghat sections, there isn’t a doubt that the Duster 85 will perform better, simply because you don’t have to contend with turbo lag. Remember my comparison between the Innova & Duster 110 on the Munnar incline? The Duster 85 would easily do that climb in 2nd gear as well. Just like the Duster 110, the 85’s clutch also requires a certain amount of effort to operate. It seems to have a slightly shorter throw and isn't as aggressive as that of the 110. Nevertheless, the 85’s clutch isn’t what I'd call a light & easy clutch at all. The 85's gearshift quality is not as rubbery as that of the 110, but it's fairly notchy. Don't expect the slickness and smoothness of Japanese gearboxes here. It does the job and that's all. 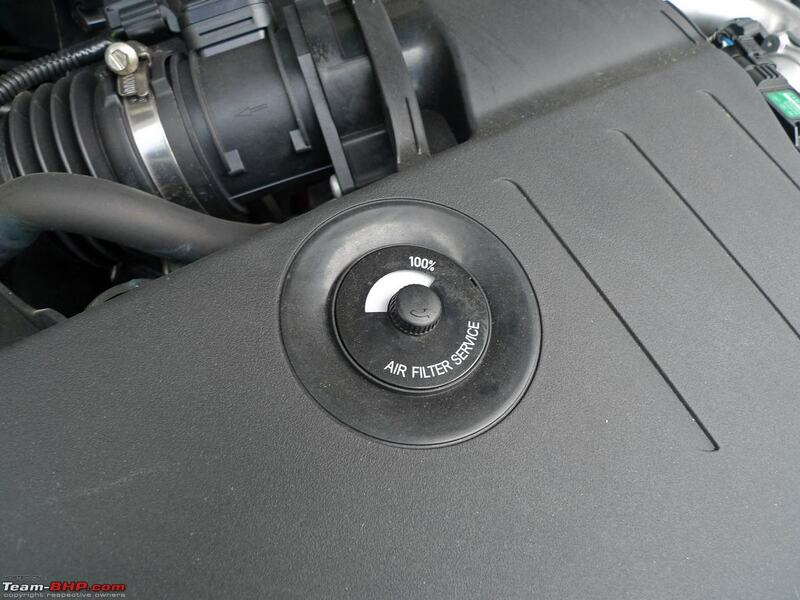 I found the Duster 85’s engine NVH levels to be excellent. However, just like the 110, wind noise is annoyingly prominent at 80 – 100 kph. 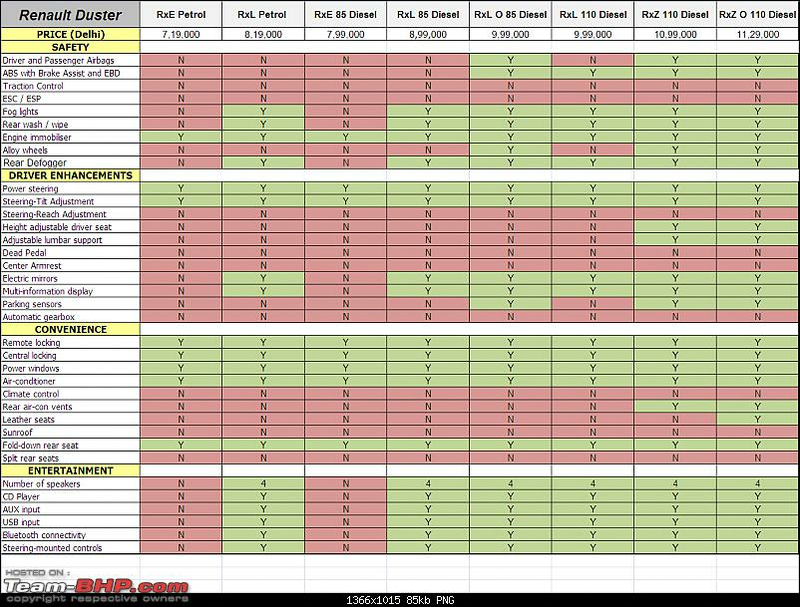 Overall, if there is any difference from the 110 variant in terms of NVH, it's not much. As a result of having lesser power though, the 85 has to work harder (higher rpm) than the 110 on the highway and thus, sounds louder at the same speed. Overall, does the Duster 85 do the job? You bet. Power delivery is adequate, even if it lacks the muscle of the 110. If you drive primarily within a congested Indian city, the Duster 85 is the more sensible choice. It’s cheaper and more fuel efficient too! This is sort of off-topic, yet worth a mention : The power steering of our 600 kms run Duster 85 had gone bust. Renault has hit the sweet spot with the suspension's ride & handling balance. The ride quality, in one word, is outstanding. The Duster flattens bad roads like few cars costing <35 lakhs do. The same stretch of broken tarmac that felt bumpy in an Innova the day earlier was dismissed off with arrogance by the Duster. Yes, there is a certain amount of stiffness felt, but its well within acceptable limits. You won't even feel the need to slow down for a bad road, especially at speed. What's more, on a flat highway, the suspension rides flat. 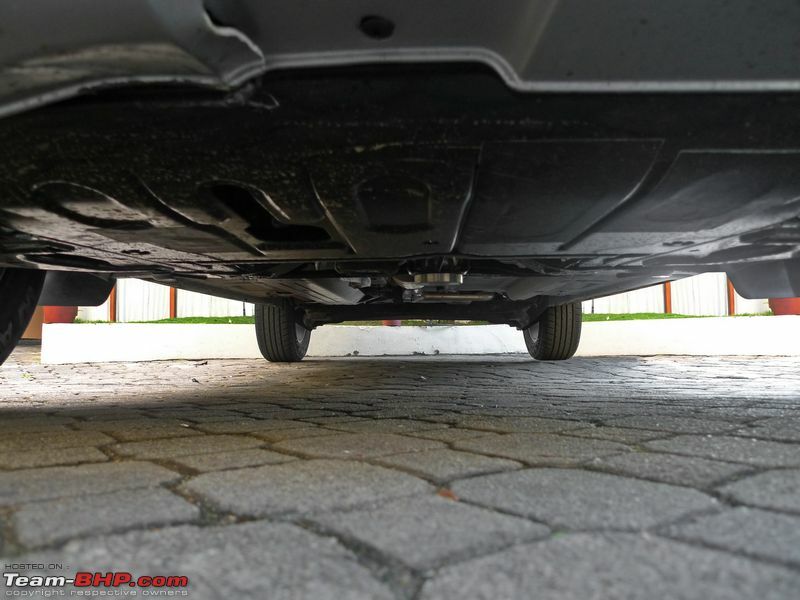 There is none of the rear end bounciness that most competing SUVs suffer from. The dampers & springs are extremely well-tuned & the suspension travel over broken roads is impressive. This level of ride quality isn't surprising as the other Renaults (Logan & Fluence) also offer superb comfort on broken Indian roads. 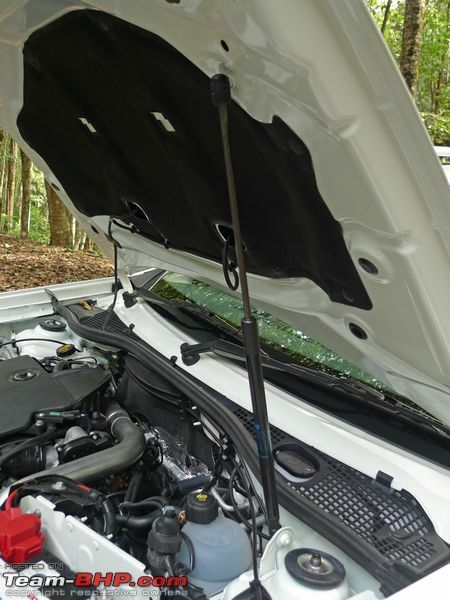 Another strength of this suspension is that it doesn't make a noise when doing its work. There are no unnecessary clunks & thuds heard on the inside. 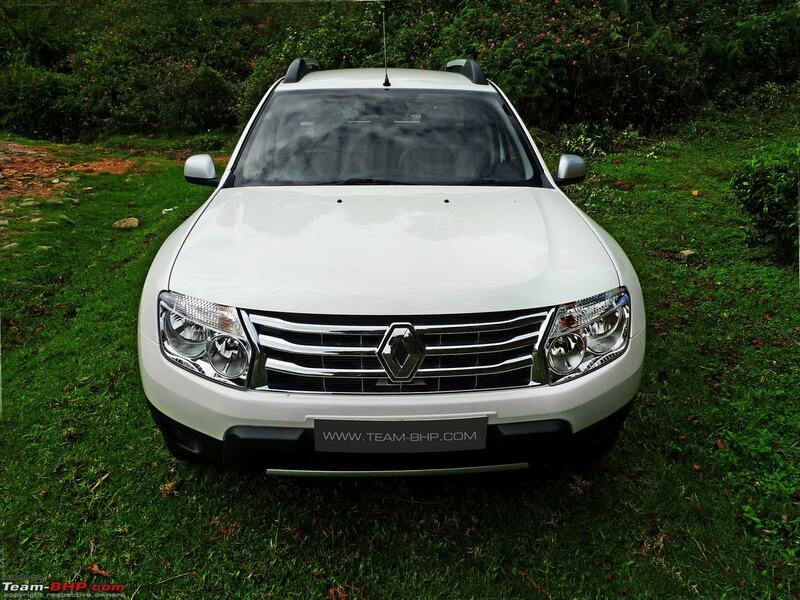 Unlike most competing SUVs & MUVs from this price range, the Renault Duster has a front-wheel-drive (FWD) layout. 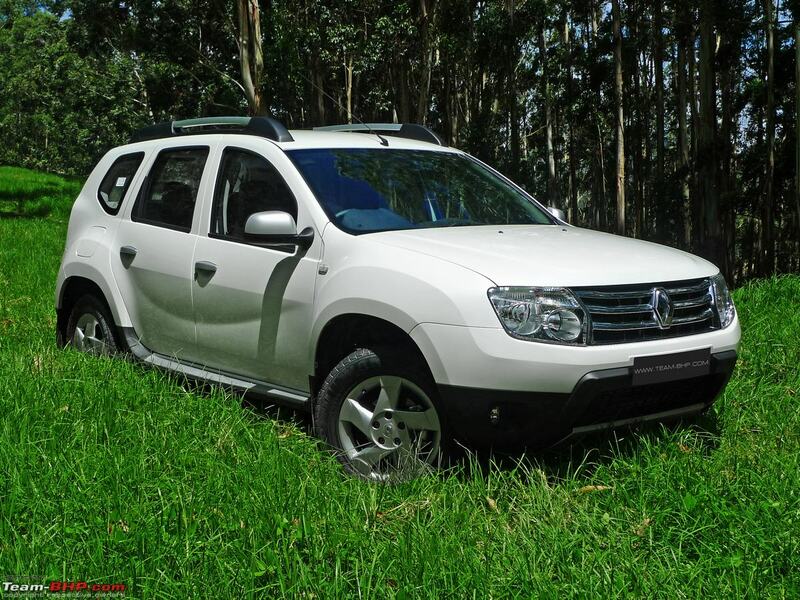 This, along with the monocoque body construction, makes the Duster very car-like to drive. The turning radius is merely 5.2 meters (smaller than that of the VW Vento), making it easy to manage within the city. At expressway speeds, the Duster's behaviour is safe & predictable. Body roll is well controlled under all driving conditions. A sedan driver doesn't have to go through a learning curve when driving a Duster for the first time, unlike the Safari & Scorpio that entail a change in your high speed driving style. Yes, there is some top heaviness felt at 100 kph, but it's within acceptable limits. Pushing into a fast corner will see the Duster settle into gradual understeer; the same is progressive and there are no nasty surprises. Straight line stability is par for the course. 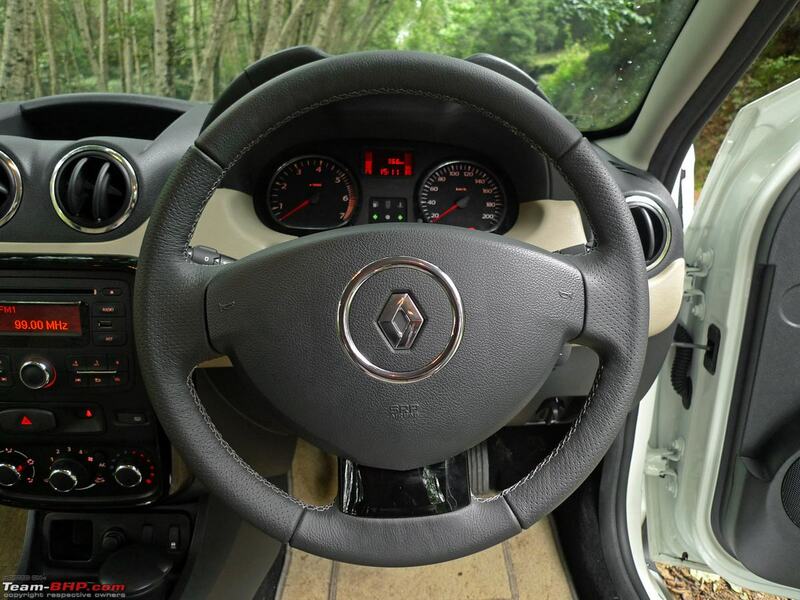 It isn't exceptional and you do need to keep a firm hand on the steering wheel, but at no time does the Duster feel nervous. I haven't a doubt that the Duster will manage a highway emergency manouveur in a far superior & safer manner to the domestic UVs. One gripe I have in the handling department is the steering wheel. 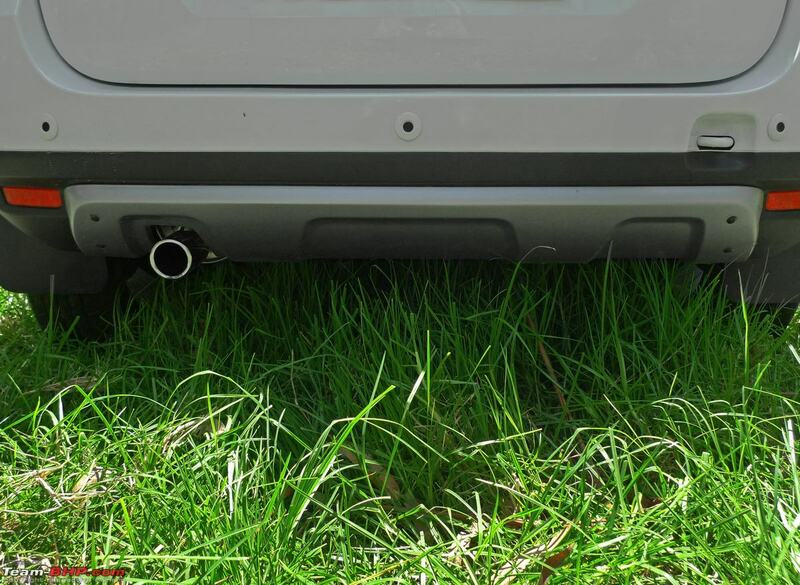 For the most part, it is well-weighted (even if it requires extra effort at parking speeds). However, the steering's center-back action is simply too aggressive. On fast turns, the steering provided a lot of resistance and interfered with the smooth inputs that I was trying to dial in. Over quick ghat sections, you literally have to fight with the steering at times. Leave aside enthusiasts, the lay man will hate this behaviour the most. I give the Duster's brakes an above average rating. The brake pedal feels spongy at speed and isn't the easiest to modulate. 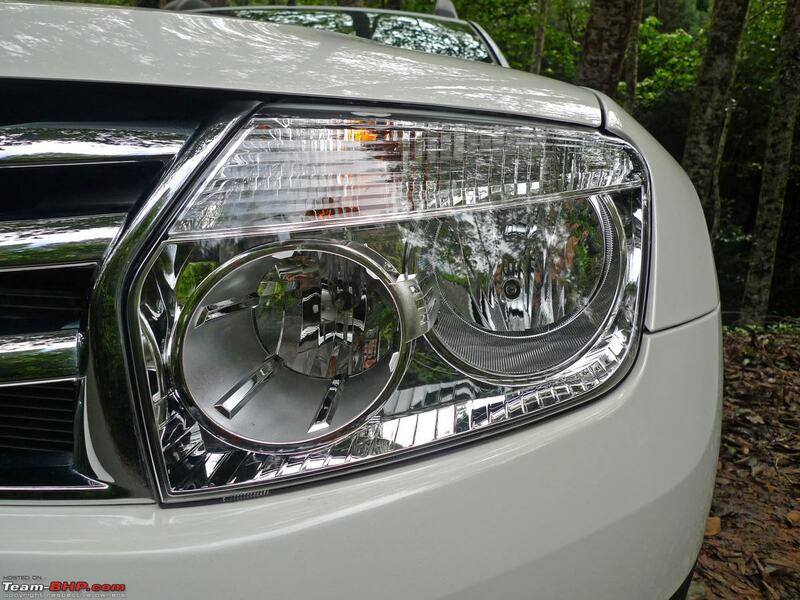 The Duster stops without a fuss, and capability is far better than the Tatas & Mahindras, but the C2 & D1 segment sedans are in a different league altogether. I was pleased with the fact that the Duster maintained its composure in an emergency braking situation. There wasn't any nosedive under braking either. I've never been much of an MRF Tyres fan, yet I'll give it to them for the Wanderer Tyres of our Duster. They provided good levels of grip, even with a heavy right foot, leaving me pleasantly surprised. Indeed, this is excellent rubber by OEM tyre standards. 205mm of ground clearance and a shorter wheelbase ensure that the underbelly doesn't scrape anywhere. 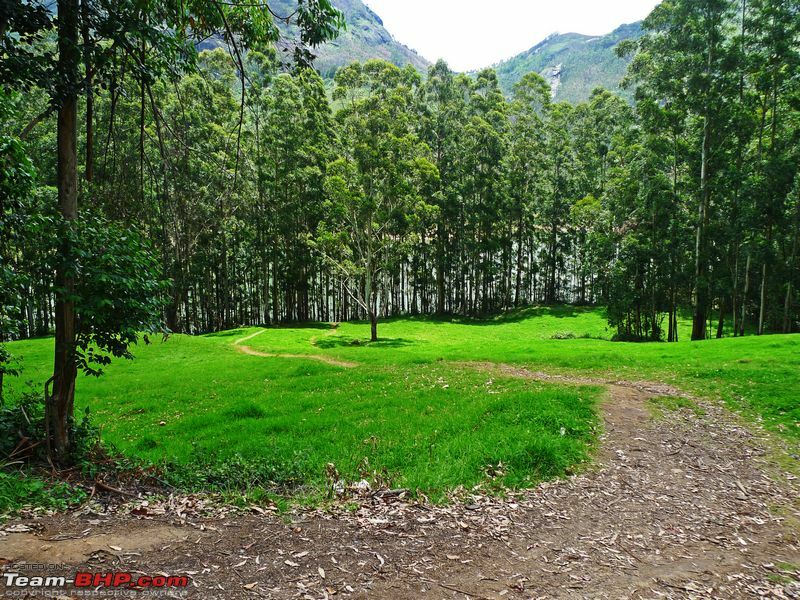 In fact, we took it for some soft-roading down a hill (see picture below) and still, no part of the SUV hit the surface. The approach & departure angles are 30 & 35 degrees respectively. 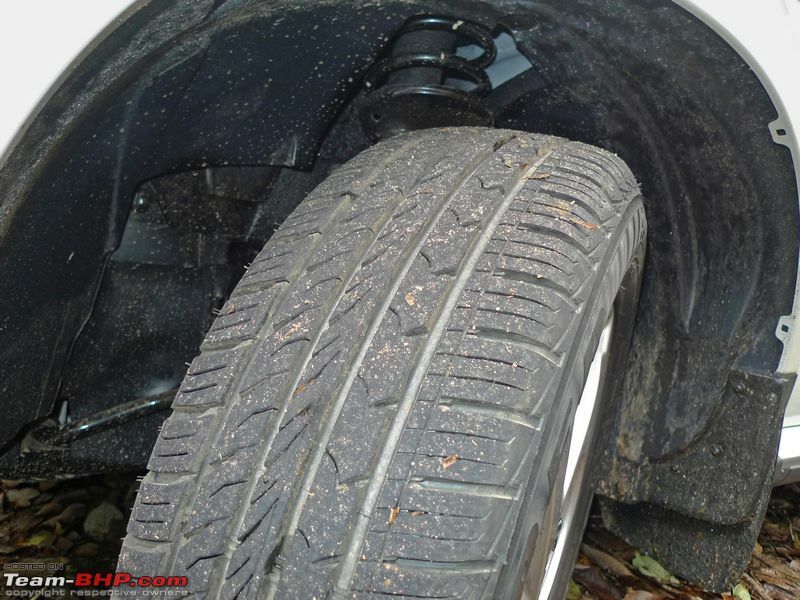 Do keep in mind that the MRF tyres are made strictly for tarmac. They lose grip easily on the likes of mud & grass. 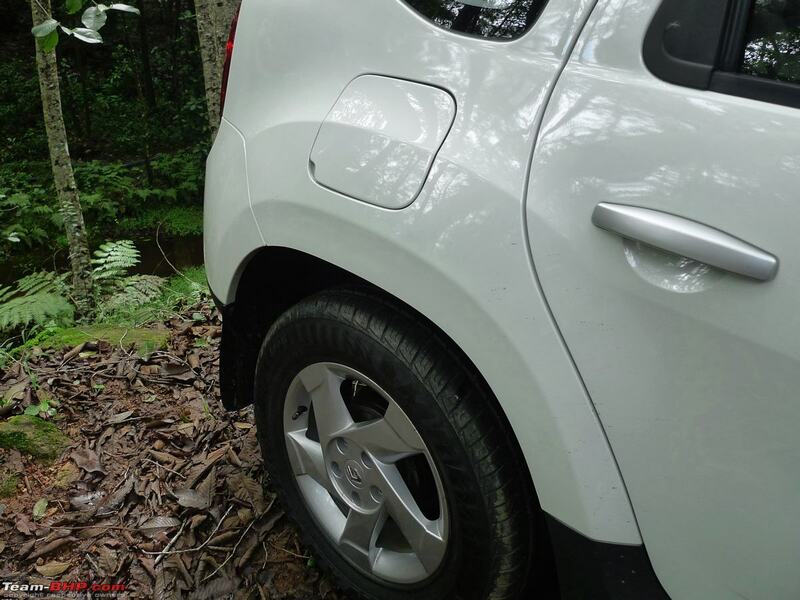 As the Duster is a 2WD, you shouldn't attempt anything remotely close to off-roading with it. Last edited by GTO : 9th August 2012 at 10:12. • An inappropriate name, don't you think? To most of us, Duster = Cloth used to dust furniture. 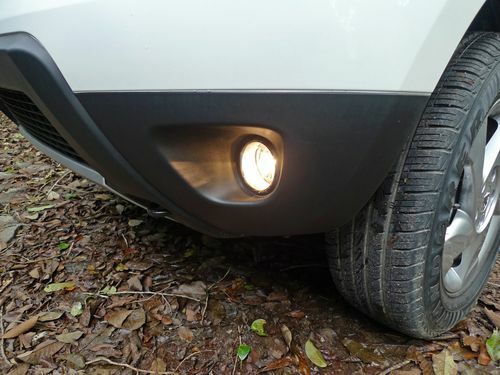 • Renault's Mumbai design studio was entrusted with the task of "Indianising" the Duster. Interior enhancements, dollops of chrome, colour combinations, repositioning of controls and more came from the designers based here. • The 2nd generation of this B platform is used for cars like the Nissan Micra, Sunny etc. • The Renault-Nissan Chennai factory will soon reach max capacity of 400,000 units per year (or ~33,000 a month). Thread Link. Export demand has been a priority of this facility since day 1 of operation. • Only the export Duster is equipped with a diesel particulate filter (for lower emissions). 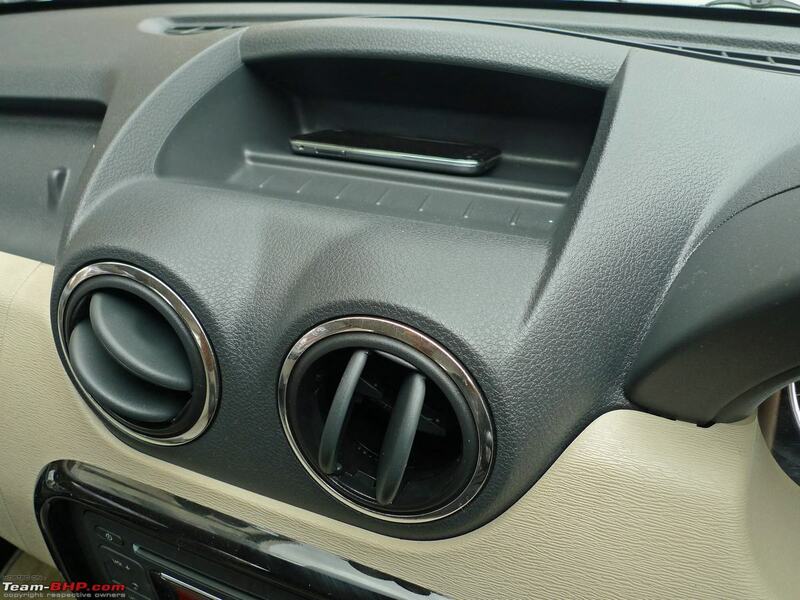 The Indian Duster meets local pollution norms without a DPF. • The (Dacia) Duster received only 3 out of 5 stars in the Euro NCAP tests. • Renault currently has 55 dealerships in India. Their target is 100 within a handful of months. Renault categorically stated that it will not share dealers with Nissan. With some cars identical to Nissan (Micra & Pulse, with more to come), Renault feels it will lead to confusion in the customer's mind. • Mumbai is a top 2 / 3 market for most manufacturers. Yet, the closest dealer from South & Central Mumbai is in Andheri! A potential customer from the financial district has to drive 90 minutes to the Renault showroom. No dealer means no visibility in the moneyed part of Mumbai. • I insist that Renault should have launched the Duster earlier. This is one time that the top-down strategy hasn’t worked. Renault hasn't established itself as a “premium” brand in the eyes of the Indian customer, has it? • Service interval : 10,000 kms / 1 year. • 4 year / 80,000 km warranty as standard. This is amongst the best factory warranties offered in India. IIRC, the only other manufacturer giving a 4 year standard warranty is Honda. • The Duster's current waiting period is 3 months. Renault has implemented 3 levels of checks so that unscrupulous dealers & middle-men don't cash in with "premiums". Apparently, each car leaving the factory gate has a sticker with the customer name & VIN inside the glovebox. 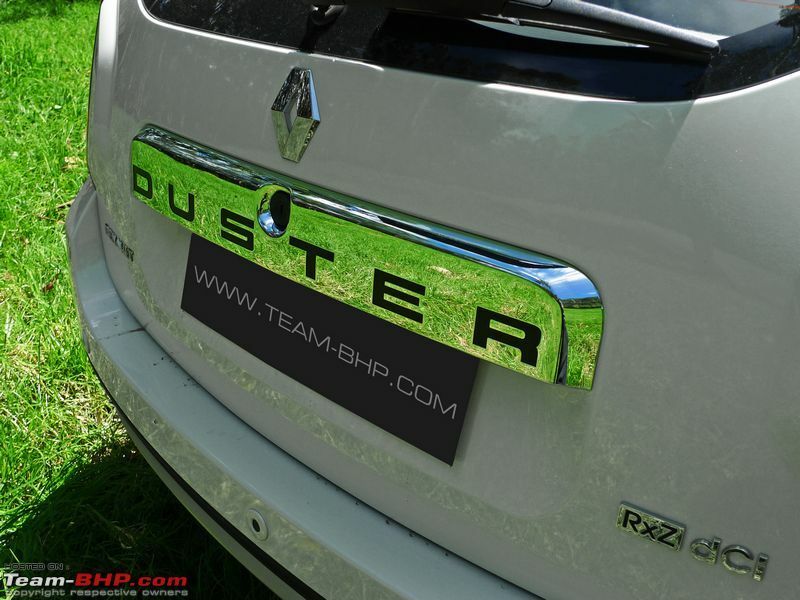 • Renault will step up the Duster's marketing in September. The pricing & first-mover advantage have already given them good momentum for now. The media brought the Duster more eyeballs than advertising could ever manage. 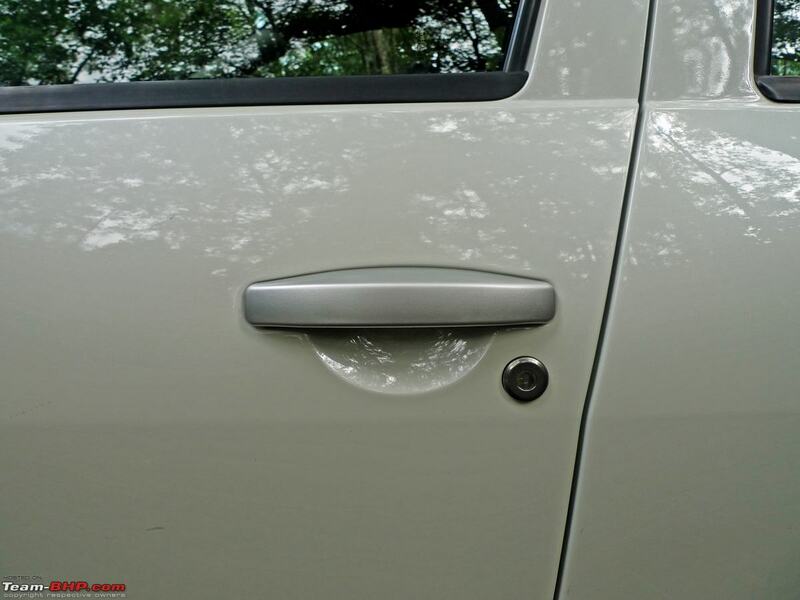 • The doors don't auto-lock once you start driving. A careless omission of such a useful feature. 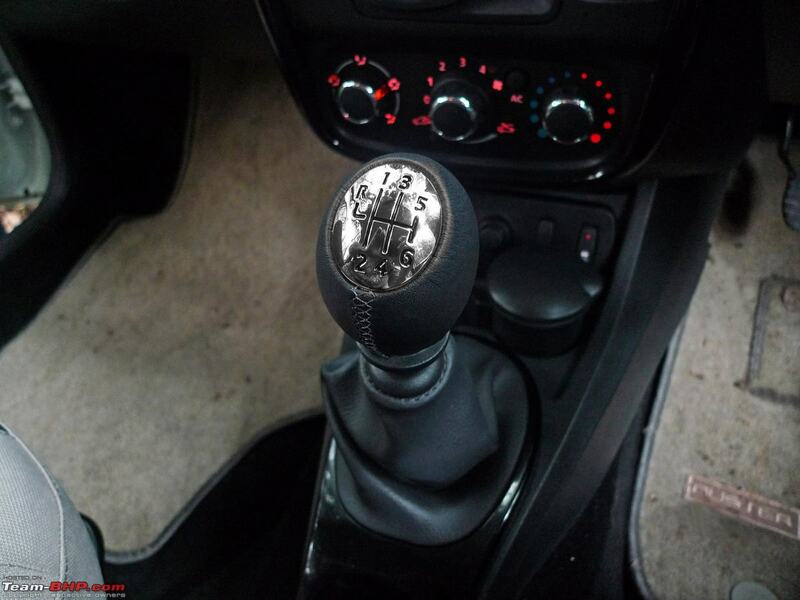 • Expect the Duster to become a customization favourite with rims, tuning boxes etc. Renault is bringing in a wide range of official accessories. A friend in the after-market business reveals that distributors have already placed huge orders for all kinds of Duster accessories (bull bars, side cladding, roof racks, wind deflectors and more). • ARAI ratings : 13.24 kpl (1.6L Petrol), 20.46 kpl (1.5L Diesel 85 PS) and 19.01 kpl (1.5L Diesel 110 PS). The Duster has a 50 liter fuel tank capacity. 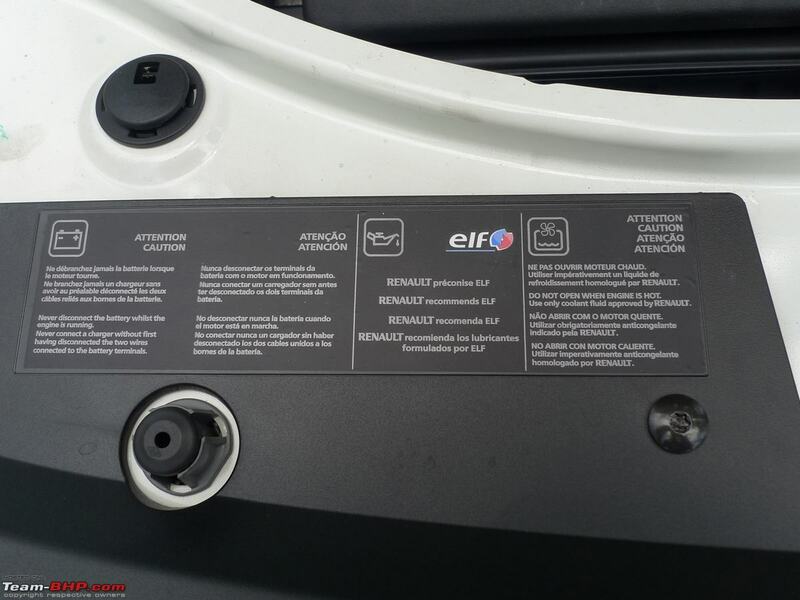 • There is no difference in the external badging of the Duster 85 & 110. • Unlike the Logan, the bonnet opening lever is on the "right" side. 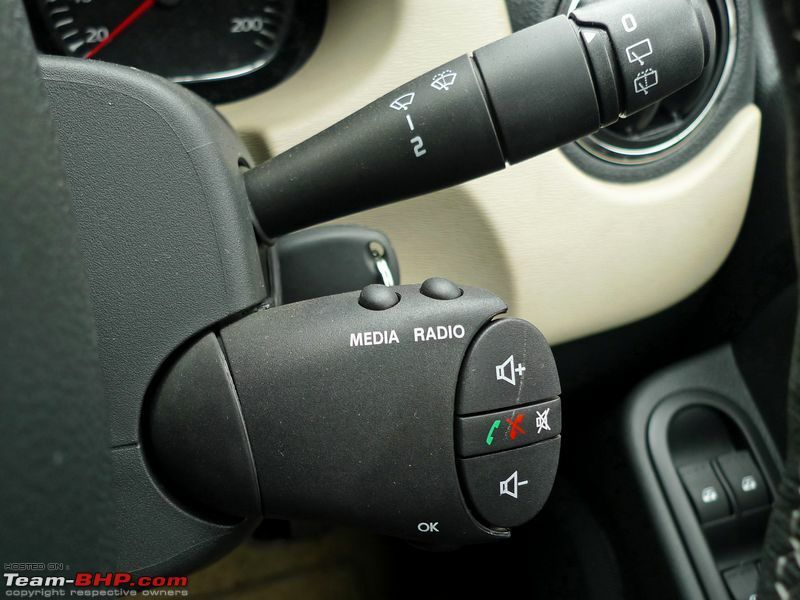 On the other hand, the control stalks remain inverted for European use (indicators on the left, wipers on the right). • A 5th Renault – the Scala (rebadged Nissan Sunny) – will be launched around the Diwali season. • The Reverse parking assistance has audible feedback only. No visual display. • What are the odds of us seeing a Nissan-badged Duster? I doubt it’ll be anytime soon. Remember, Renault as the parent company, will be unwilling to share the Duster’s limelight. • Thanks to BHPian MAS for pointing this out : In Tamil Nadu, the sales tax for cars costing <10 Lakhs is 10%, and that for cars costing >10 lakhs is 15%. As Renault chose to price the 85 BHP RxL+ Option Pack (and the 110 BHP RxL) 16,000 more than 10 Lakh, the customer ends up paying Rs. 50,800 additional taxes! • The woodland brown colour divides opinion...personally, I think it really suits the Duster. Check it out in our launch report. 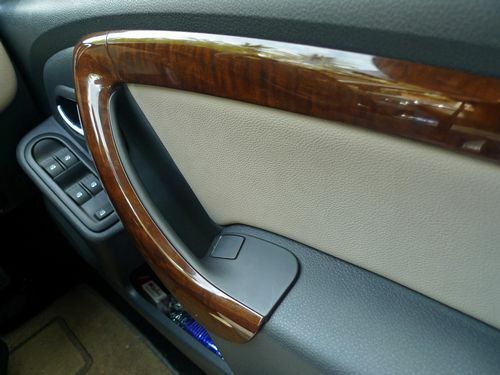 • If you have long arms, the rear air-con unit could interfere with your left hand while changing gears. • Strangely enough, the brake lights don’t work with the ignition off! The headlamps do. 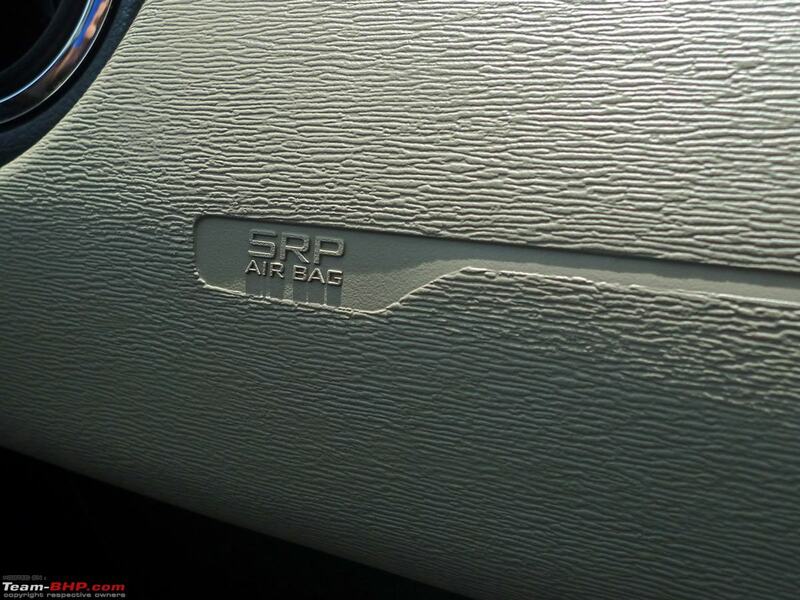 • The rear air-con functions independently of the front. Remember to switch it off (separately) when not needed. • Thanks to the light weight & compact dimensions, a Duster with 4x4 and A/T tyres would be capable enough to keep 98% of the aam junta satisfied. • The turning indicators make a beeping sound like a motorcycle, rather than a clicking indicator sound that most cars make. 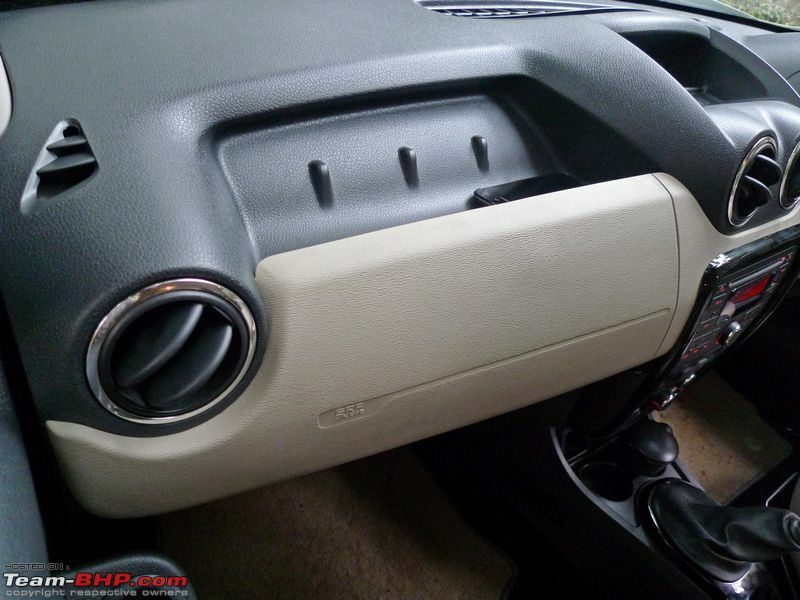 • The Duster has a meek single-unit horn. A powerful dual-tone unit would have been better. 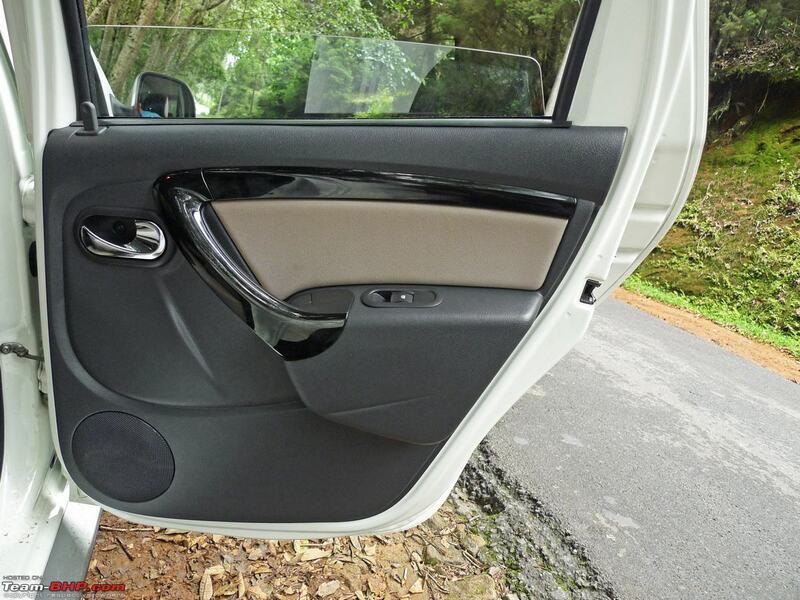 • You can see the car's body colour from the inside, on the door frame. Unusual with cars of today. • When driving through narrow gaps or densely trafficked areas, account for the bulging wheel arches when calculating the gap. • The black piano finish is a huge fingerprint magnet! 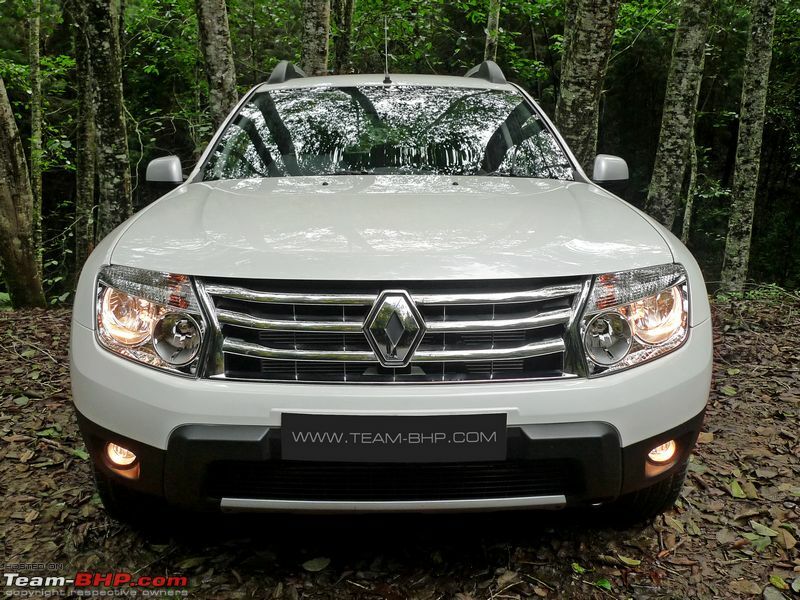 • Disclaimer : Renault invited Team-BHP for the Duster test-drive. They covered all the expenses for this driving event. • Thanks to Stratos for processing the pictures! Last edited by GTO : 7th August 2012 at 14:41. Superb and much awaited review! Covers all the details, and i don't really have any questions left in my mind after reading it. As for the 85 PS version, just a one word confirmation that its in exactly the same state of tune as the Sunny will be enough for me. 1) The thing that impressed me most about the Duster after reading the review was the praise for its ride quality. Unlike most of the Indian market, I really don't care for "SUV looks", however, when in an "SUV" i expect the ride over bad roads to be significantly better than a sedan. 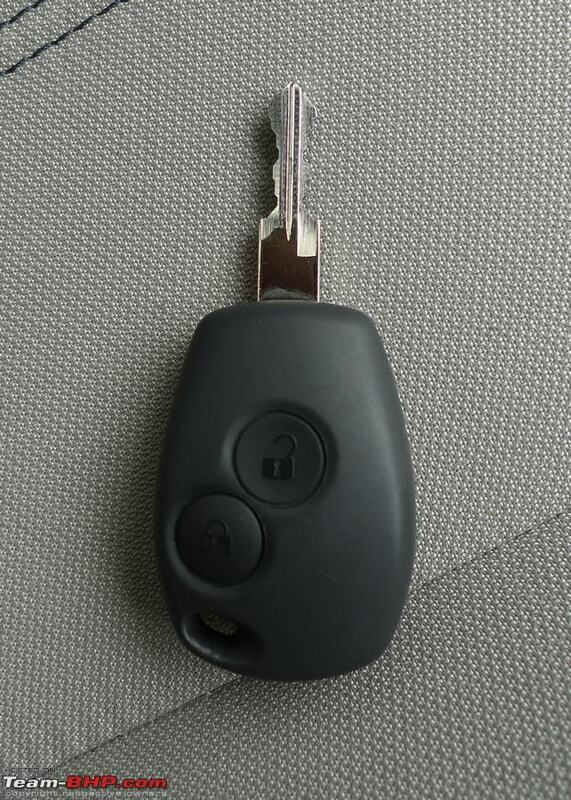 Most current SUVs fail miserably at this. Glad that the Duster is a bit different here. 2) Personally, i think the jump-seat for the rear is a brilliant idea. There are a lot of families looking for a car that can take the full family out on the town once in a blue moon. Unfortunately a pure 5 seater wont fit that bill. However, a make-shift additional seat in the rear will do the trick. 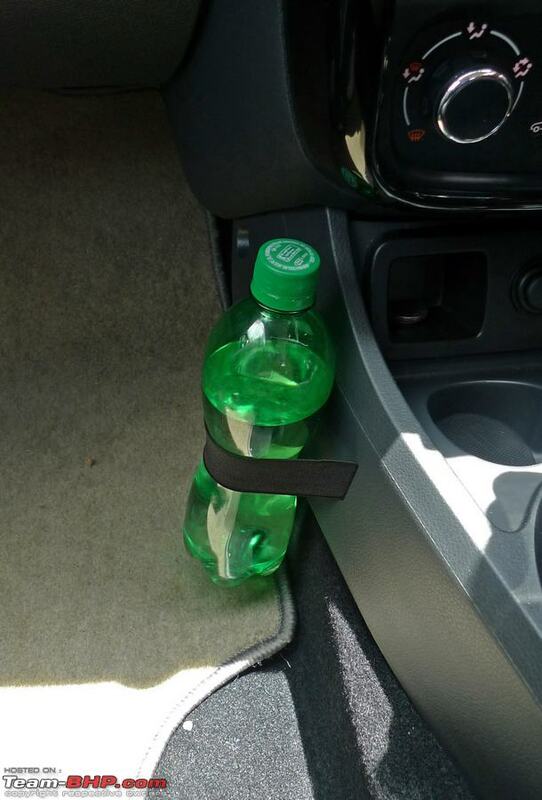 When it comes to safety, its just like the side seats on a Sumo or Scorpio. (Also i think dealer fitted items don't come under the RTO/ARAI's jurisdiction). Last edited by Rehaan : 21st July 2012 at 20:54. Got a quick question for you, if you had 12.5 big ones to spare at this point of time, would you pick up the Duster (85 O Diesel)? As usual wonderful review there GTO. The Duster sure gonna be a seller here. The heavy clutch is well... heavy indeed,but on the move one doesn't feel it. The horns on the other hand are real pain to use, so much that i only horned 50% of what i normally do. 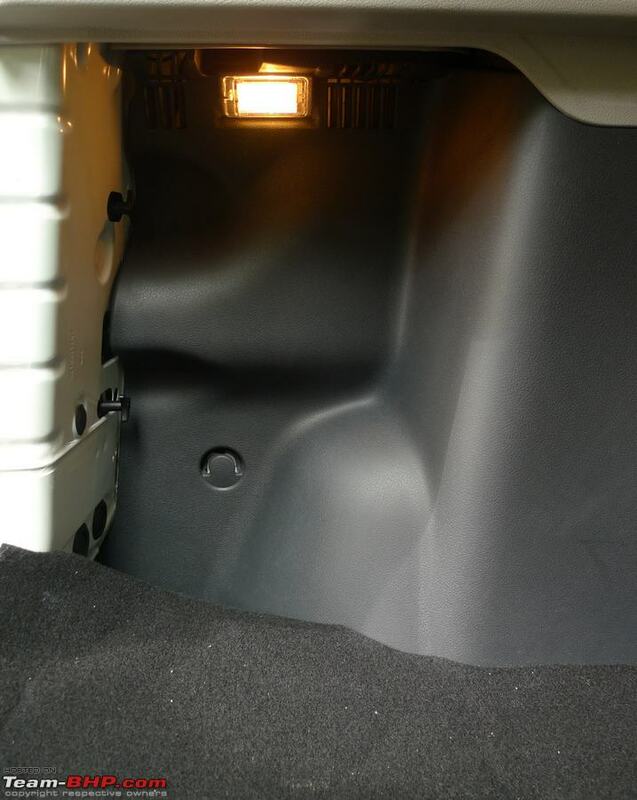 And the jump seats, seeing the big boot, i saw it coming sooner than later. But not as official accessory.!!! Great review! I guess the 85 bhp variants would be flying off the shelves. With such expected volumes, the focus is now on Renault's service backup. Great review!! Inspite of the evident cost cutting, I feel the car will do well. For some reason I like it, even with it's shortcomings. However given the price range, and some of the drawbacks, you would think twice before putting your money on this car; and also consider all other available options at that price range. It is immediately evident; that many parts are shared with Micra/Pulse/Sunny. 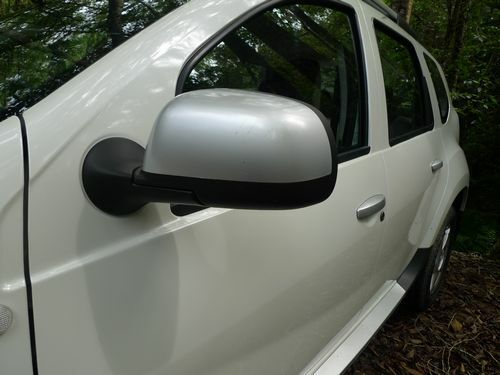 The only bit I didn't like was the el-cheapo door handles. Great review GTO. Finally a picture comparing it to another SUV. All other reviews had only standalone photos, so there was no way to actually have a frame of reference for the size of the car. Now I can go and look at the car finally. Didn't want to waste my time if it was too small. On the whole, I really like this car. The 85 Rxl with options, seems like the perfect buy, Priced well too. Please do add the review of 85ps version as soon as possible. 1- Were the feel of brake pedal, similar to the sunny ? I drove the sunny and the brake pedal was just behaving weirdly. 2- Do we get AC vents under the front seats, for rear passengers ? Superb and much awaited review! As usual covers all the details. Renault will have the first mover advantage and would see success in this launch. 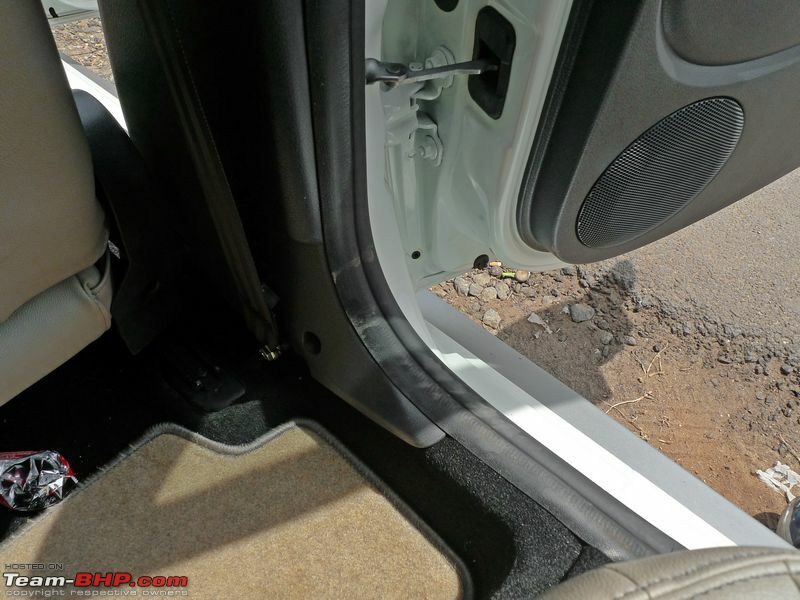 What is striking in the Duster review is the ride quality which one expects from this segment - "Crossovers". Super Review GTO!! Finally the much awaited review is up. 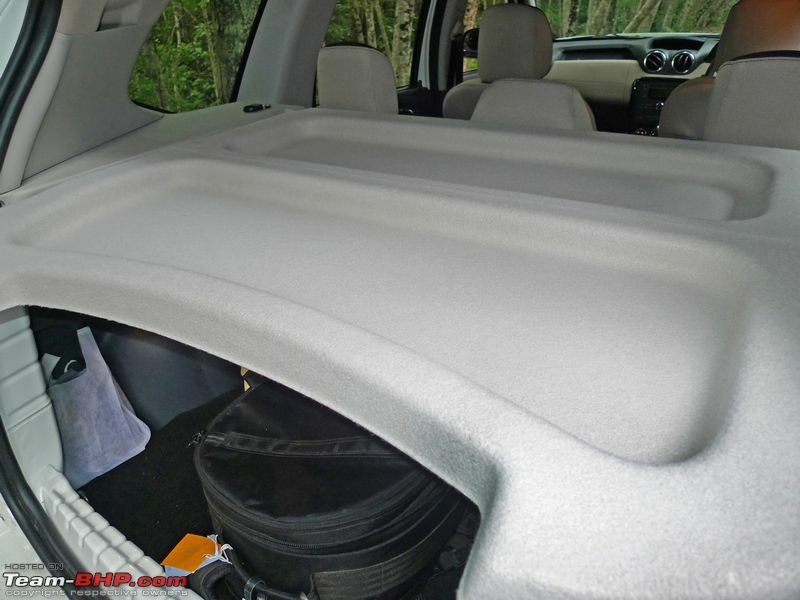 I find Duster just the right amount of SUV for general use. Being based on car platform, it is light, meaning it will deliver small car like 20kpl on Highways and very good performance even with the small(for a SUV) 1.5 litre Diesel. Going by the figures, the 0-100 figure of 12.59 seconds(ACI) it is in the league of the fastest SUV's around, fractions of a second faster than Fortuner but fractions of a sec slower than XUV. Yeti is faster. Good to know about the absorbent ride quality and secure handling, i feel sick in constantly bobbing Scorpios' and Safaris'. 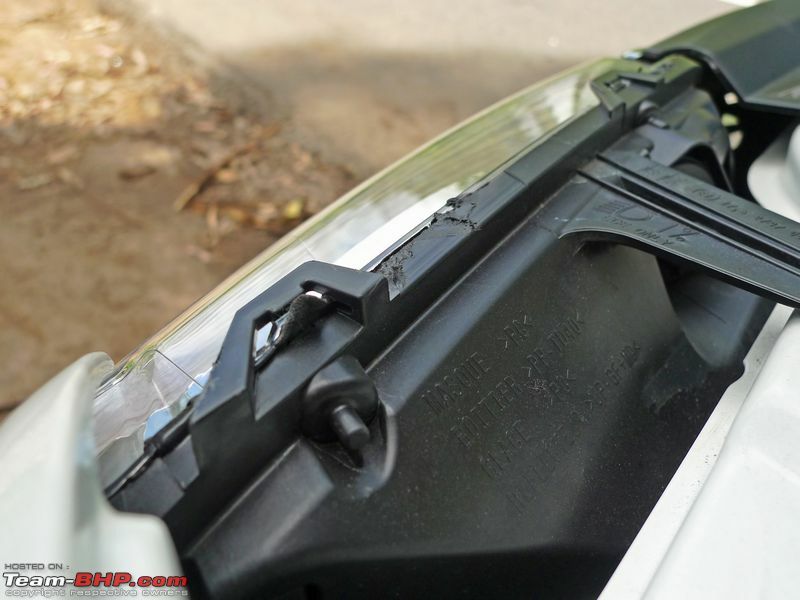 Certain plastics and rubber parts look extremely cheap for a car of this segment, they might not age well with time. This car could have been in my Punto upgrade list if 4wd was available. EDIT: The figures are even better in their proper tests: 0-100 in 11.88secs making it faster than even XUV and Fortuner and in the same league as Yeti 110. Yeti 140 is a sec faster. All times are GMT +5.5. The time now is 14:27.